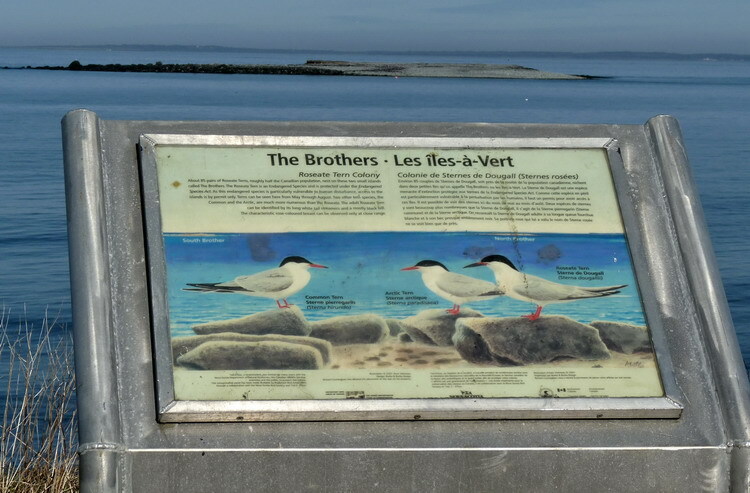 The first terns were reported at North Brother on May 2, 2014. 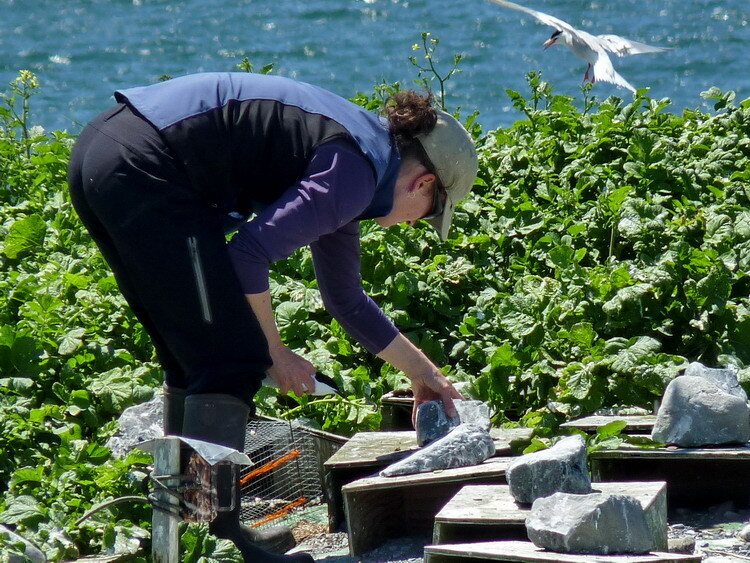 Five or six terns were seen there by a local lobster fisherman. 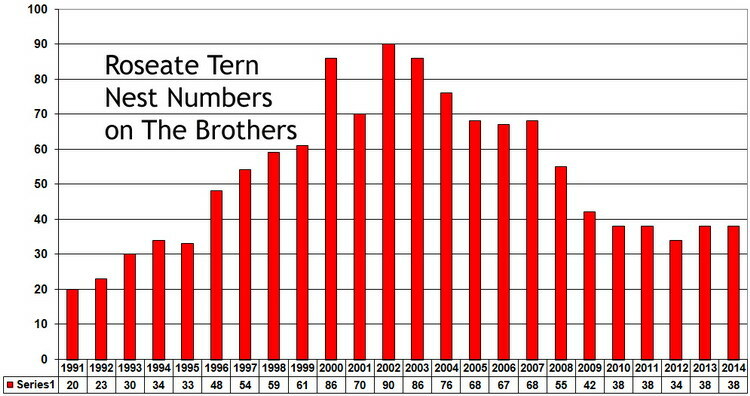 Total tern nests on The Brothers was 732 (the highest number since 2003). Terns were only on North Brother again in 2014. This was up a bit from the 684 in 2013. (Down from max of 880 in 2001). No terns nested on South Brother in 2014. There is not much left of South Brother. It is quickly being washed away. Breakdown by species: ROST 38 nests (5.2%), ARTE ?44 nests (6.0%), COTE ?650 nests (88.8%). This summer, I failed in my effort to properly document the ROST chicks. I can only say that we banded 16 ROST chicks this summer; all on July 11. On a brighter note, ROST chick mortality was low. Very few (2 or 3) were found dead. Also, some unbanded ROST chicks were still seen on the island after July 11. Of the 38 ROST nests, 22 contained one egg and 16, two eggs. Most of the eggs hatched. 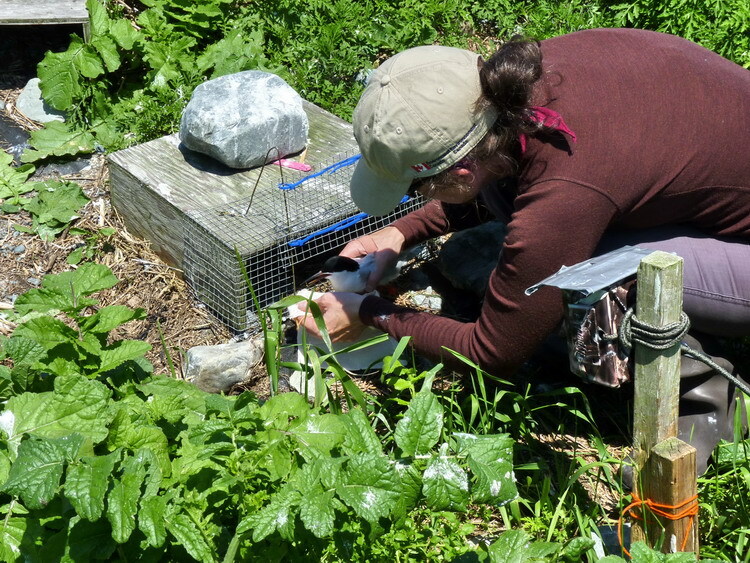 On June 12, 2014, 6 adult ROST were captured by treadle trap and fitted with GPS tracking tags by CWS. On June 17, three of these birds were recaptured. Two had lost their GPS tags and the one tag retrieved showed very little travel. All the data points were at North Brother. 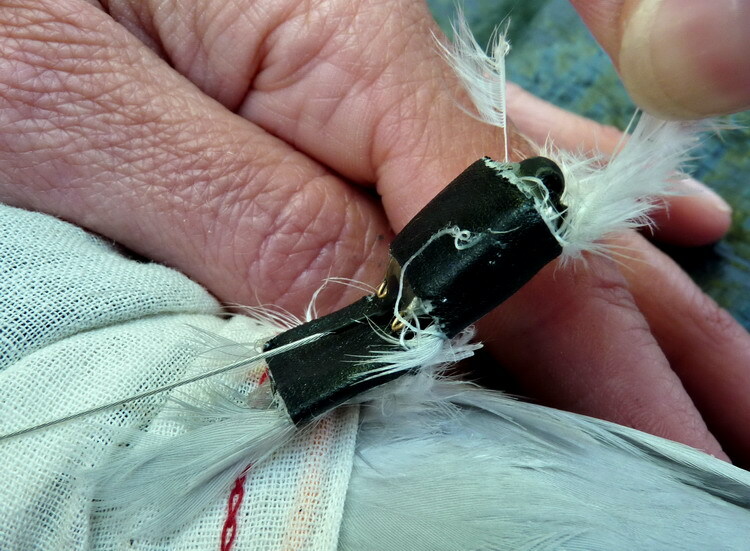 Also of note, the retrieved GPS tag was holding on by a couple of small feathers only. Lucky this one had not been lost. We were not able to retrieve any more of the GPS tags. We were very disappointed that this had not worked out. One thing I think we did well this summer was the capture and banding of adult ROST. Much of this was due to the capture and recapture aspects during the GPS tagging project. Also, more effort was placed in reading the adult ROST leg bands of uncaptured ROST through photography. 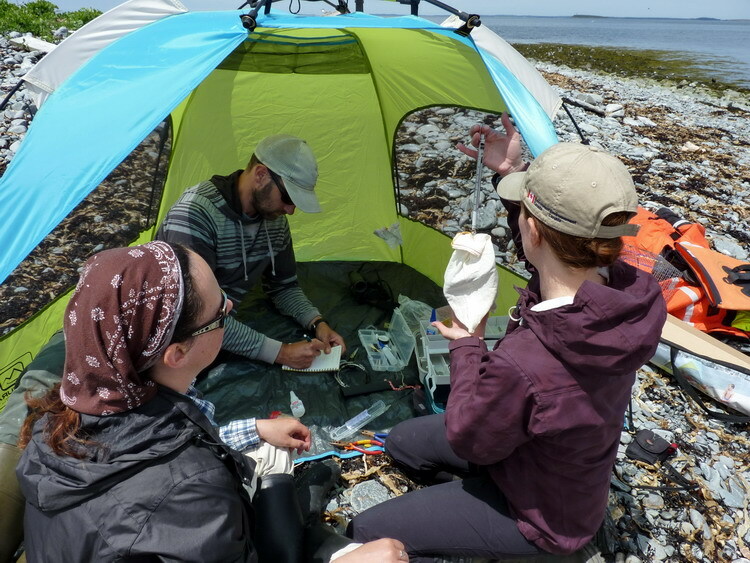 In all, we read 32 bands - 28 birds had been banded on North Brother (9 as chicks and 19 as adults), 2 had been banded on Country Island, NS, one had been banded on Bird Island, Buzzard's Bay, Mass., and one had been banded on Stratton Island, Maine. A ROST, photographed by Ronnie d'Entremont had a different style of metal band. I could read "AVISE" on it. Dr. Jeff Spendelow informed us that it was an "AVISE Cemave" band from Brazil. I destroyed three gull nests on The Brothers in 2014. All were Great Black-backed Gull nests on South Brother. Erosion continues to be a problem on The Brothers at about the same as last year - about 1/3 metre on the south and southwest edge of North Brother. South Brother remains on the edge of becoming a reef! July 5, 2014: Post-tropical storm, "Arthur" hit the province very hard and had uprooted trees everywhere. 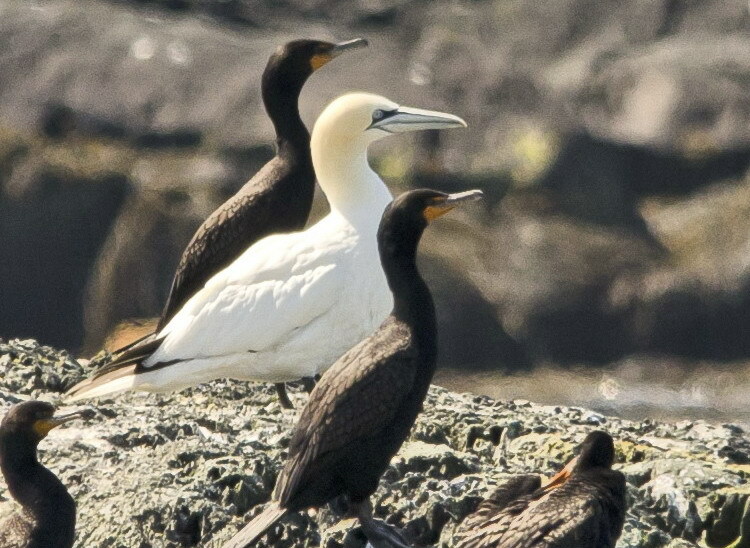 Thousands of birds were brought to Nova Scotia by Arthur. Most of them were Laughing Gulls (thousands) but there were also dozens of Black Skimmers and at least four species of terns not normally seen in Nova Scotia at any time of the year. After the storm, what we found on North Brother was plenty of carnage but not total devastation. 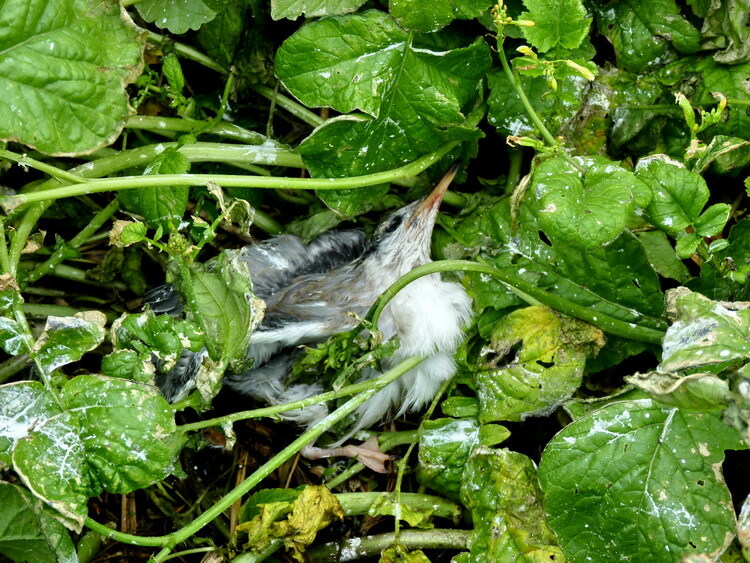 A lot of COTE and ARTE chicks were found dead on the beach and in the vegetation. Many were quite well feathered and within a week or so of flight. However, there were also lots of live chicks being brought food by their parents both on the beach and in the vegetation. The vegetation is still an ongoing concern on North Brother. 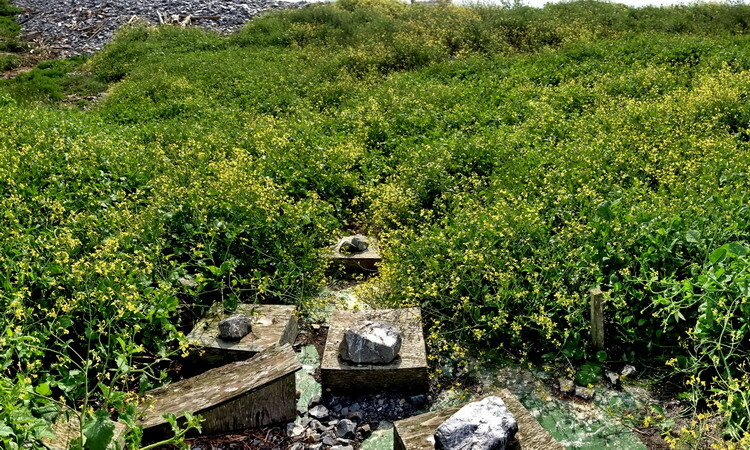 Raphanus raphanistrum (Wild radish), Ambrosia artemisiifolia (Common Ragweed), and Polygonum (cp) ramosissimum (Bushy knotweed) are the main problem plants. These bushy plants which are only centimetres tall when the terns begin nesting, quickly take over the Common and Roseate Tern nesting areas. They affect the COTE more than the ROST, as the latter nests mostly in manmade structures where they are more protected from the elements. 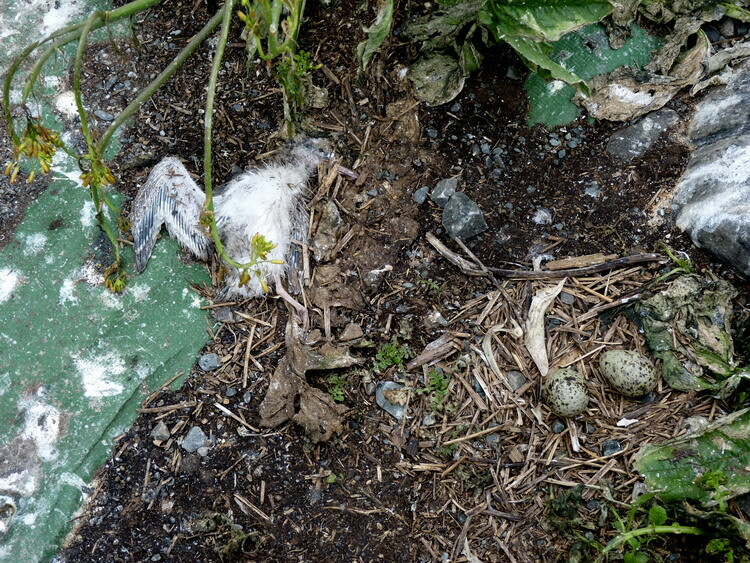 This summer, too many eggs did not hatch because of this, and we also saw too many dead COTE chicks in the vegetation, primarily in the Wild Radish. The ARTE nest in the open, in the non-vegetated beach cobble, so the vegetation concerns of the COTE does not apply to them. The vegetation became an issue on North Brother in 2008 after Meadow Voles arrived. 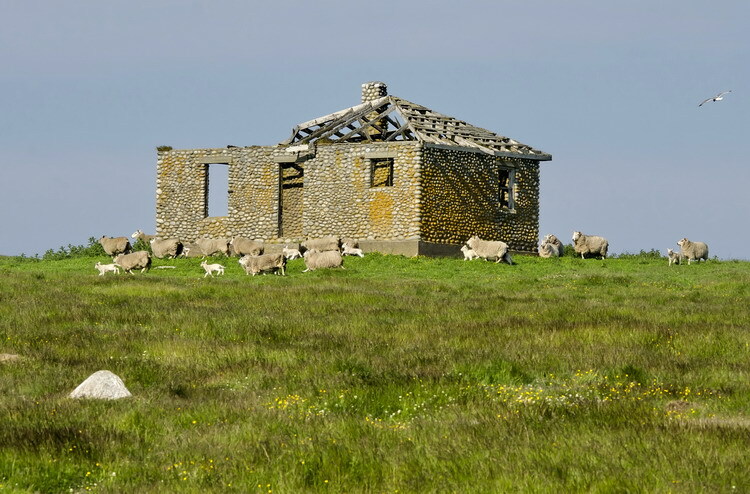 After their arrival, much of the island's grasses were replaced by radish, knotweed, and ragweed. Even the grass transplants of April 2011were gone by April 2014. I suspect the proliferation of Meadow Voles over the winter of 2013/2014 was to blame. (Meadow Voles were first seen on S. Brother in April 2002). 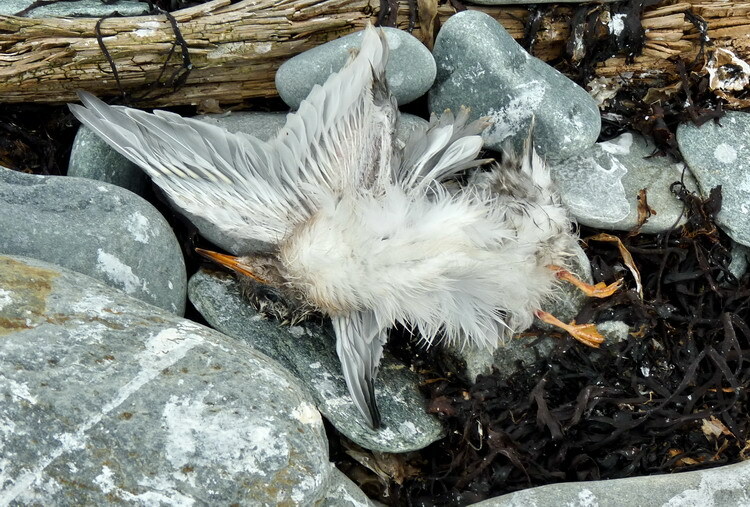 As to predators in 2014, only a few terns were killed, likely by owl. In Summary, 2014 was a fair year on The Brothers. The total tern nest number was the best since 2003 and the Roseate Terns did well except that their nest numbers are still too low (at 38). 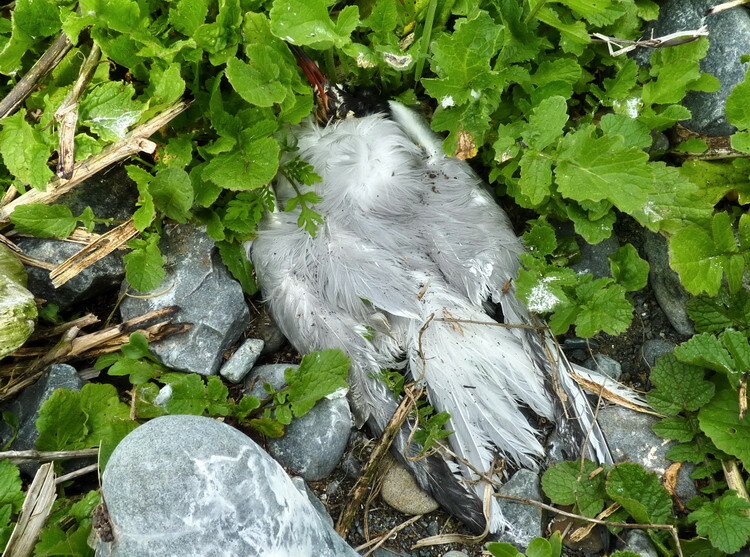 The Common and Arctic Terns did not do quite as well, probably due to the fact that they nested in the open where there was no protection from the elements, or in the thick cool and damp vegetation where many eggs did not hatch and chicks died (I assume from the cold). The GPS tagging did not get us the expected results but a good exercise just the same and we learned from it. My thanks to CWS and NSDNR for allowing me to "manage" The Brothers again this year, especially to Julie MacKnight and Karen Potter of CWS. 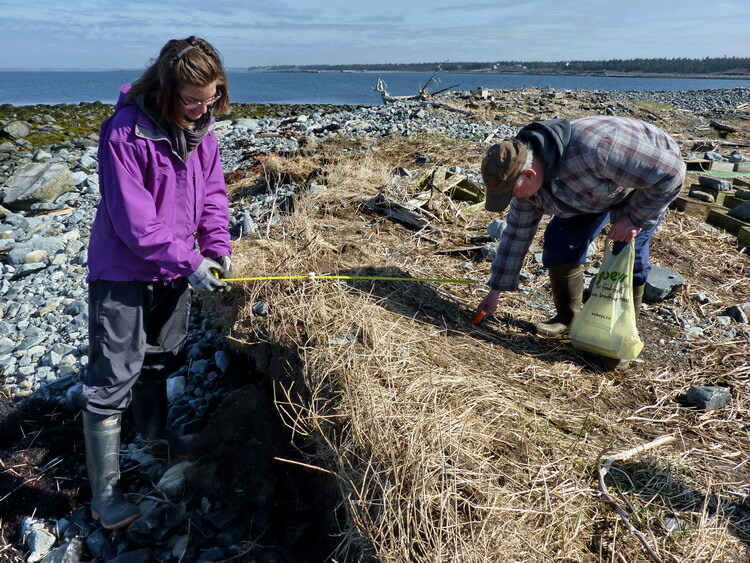 Also a thank you goes to my many local volunteers and assistants, principally Rémi d'Entremont and Hailey Hayens, without whom I would not have been able to do the job. The following is a chronological listing of my 2014 work with terns in general, of the Lobster Bay area, but especially with the Roseate Terns (ROST) of The Brothers. 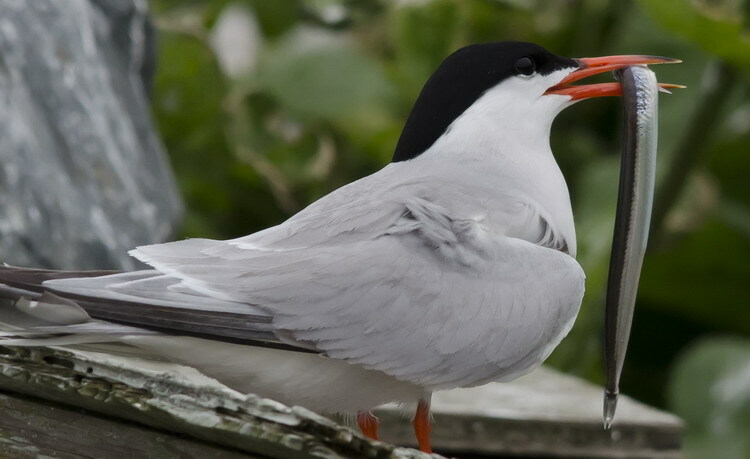 The report also includes tern observations from other local residents. March 1, 2014 Today, I lost my good friend, Israël d'Entremont. He died at The VG Site, QEII Hospital in Halifax, NS. He was 80 years old. He died from a Shock Wave Lithotripsy (SWL) procedure to "blast" away a kidney stone into tiny fragments which will then be voided in the urine stream. Apparently the procedure perforated his bladder and within a day his organs began shutting down but the cause could not be determined at the time. It was not until a week or so later, after he was transferred from the hospital in Kentville to the QEII in Halifax that the doctors discovered the perforated bladder. The hole was surgically repaired, but by then it had gone on for too long, and he died a couple of days later. I have known Israël since I was very young. He was my dad's first cousin. 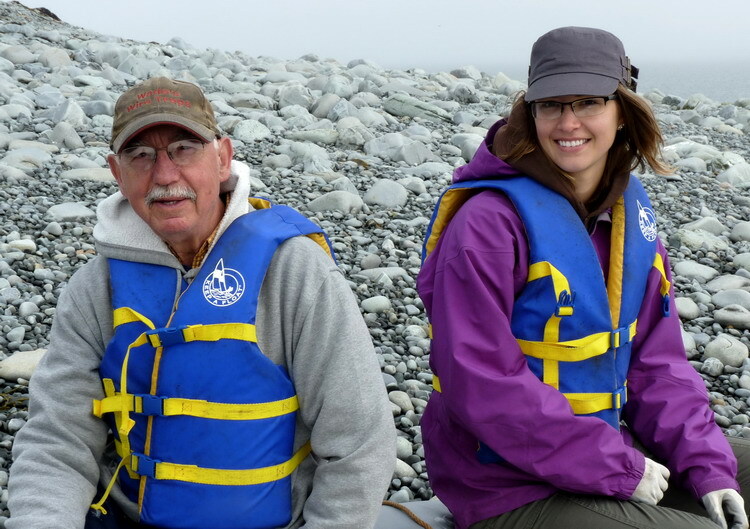 I believe it was in 2002 that he first became a member of my crew of assistants, when I would go aboard my boat on island expeditions in Lobster Bay. 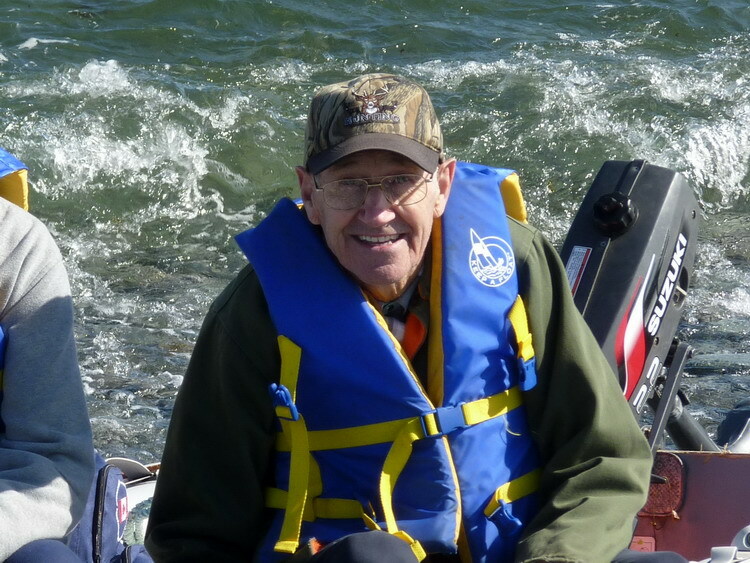 He was very knowledgeable in many fields, but especially nature, fresh water fishing, hunting and trapping. He was a carpenter by trade but a musician and a wood carver and painter at heart. It was always fun to be in his presence as he was blessed with a quick wit and could always hold his end of any conversation. I miss him very much. From his obituary, "One couldn�t think of Israël without thinking about the outdoors. An avid hunter and trap�per as well as sport fisherman, Israël spent many hours in the woods enjoying nature. 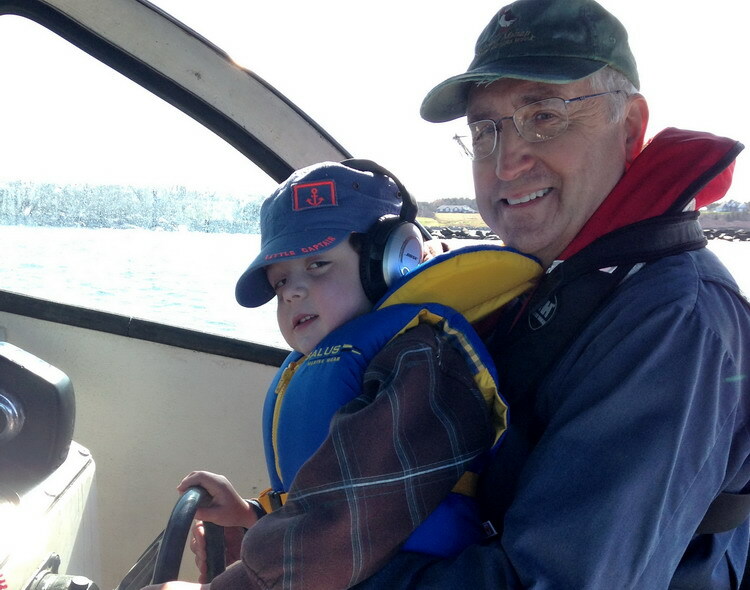 Many weekends were spent at his camp on Maple Point, across Great Pubnico Lake. Music was passed down to him and also a big part of Israël�s life. He enjoyed jamming with his guitar and his friends, a big grin on his face. He will be missed at the Red Cap for tea. But first and foremost Israël was a family man who thought the world of his family. His wife and children will miss him greatly but the memories will last forever." April 17, 2014 - We had a good morning on North Brother. 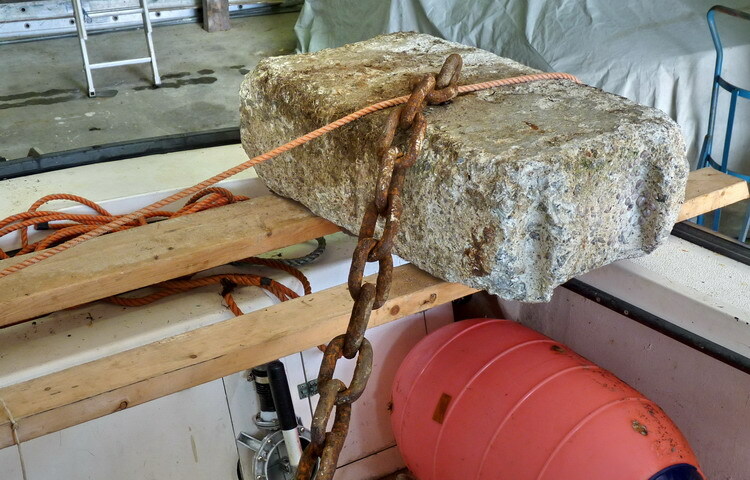 The anchor was laid in place and we had no problem getting ashore. I had brought with us a couple of rakes and the dead vegetation was efficiently taken care of. We were on the island about 90 minutes and I thought the time went fast. (not sure if my assistants also felt that way as I was pushing them pretty hard). The voles were still there in numbers. I even caught one in my gloved hand. 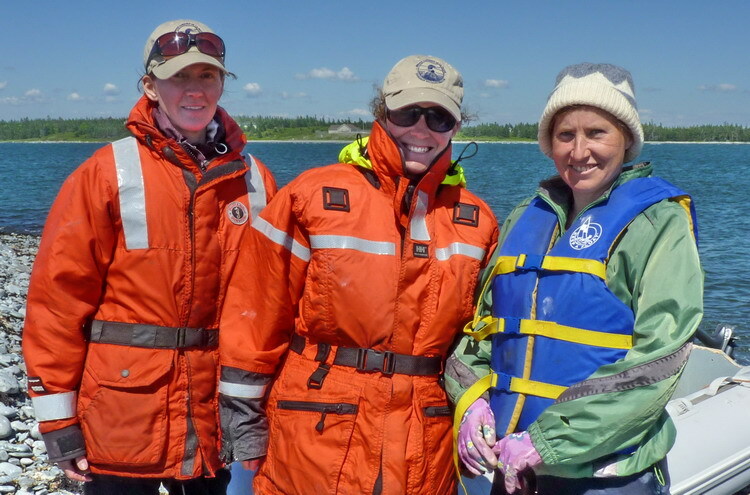 My crew and assistants today were Rémi d'Entremont, Germain d'Entremont, and Hailey Heyens (a biologist who recently moved to Yarmouth). April 22, 2014 - North Brother. The island is pretty well ready for the terns. 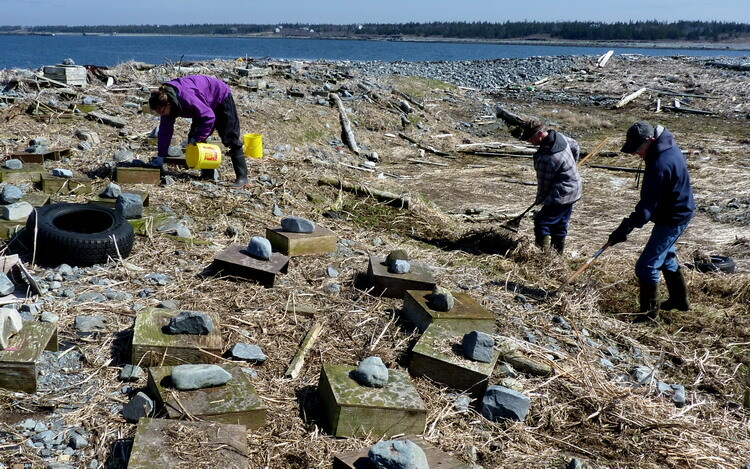 We did some more raking of dead plant (weed) material; we placed the erosion measuring pegs on the south edge of the island and arranged most of the nesting shelters, adding gravel where it was needed. There is more decaying (composting) plant material among the nesting shelters than in previous years . I suspect this will mean more weeds growing there also. 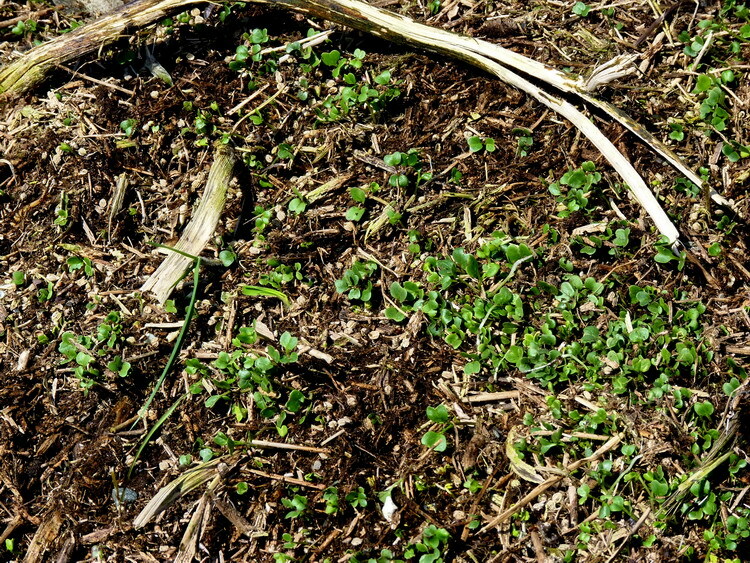 In many places, removing the dead plant material revealed multitudes of weed sprouts. I did not see any voles this time on the island and none of the crew reported seeing any either. 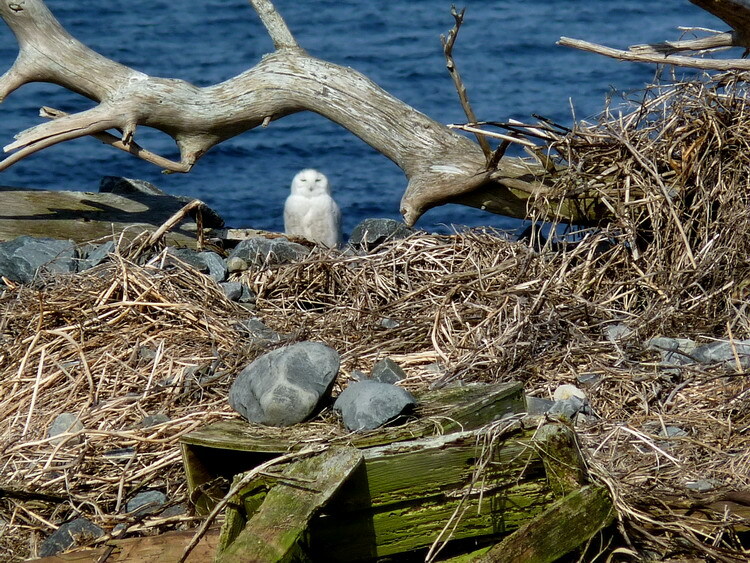 We did, however, on our arrival there, see a Snowy Owl taking off from the ROST nesting area and flying to the water's edge on the western side of the island. 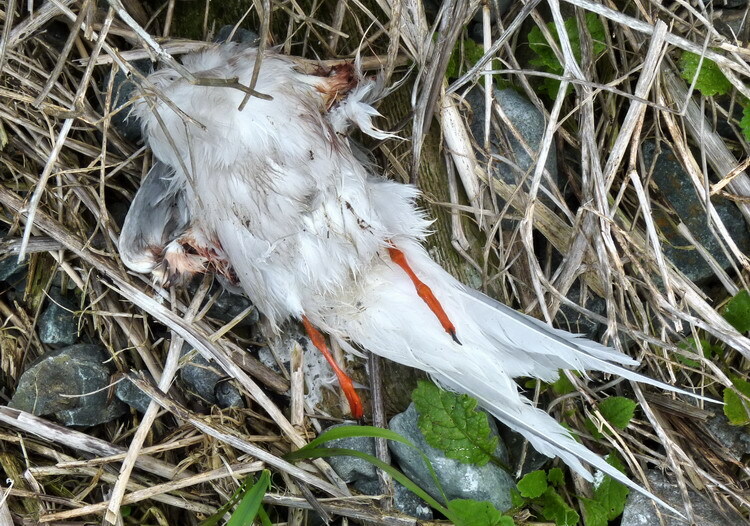 I assume It had been feeding on the voles. I think the owl was still on the island 75 minutes later when we left for home. 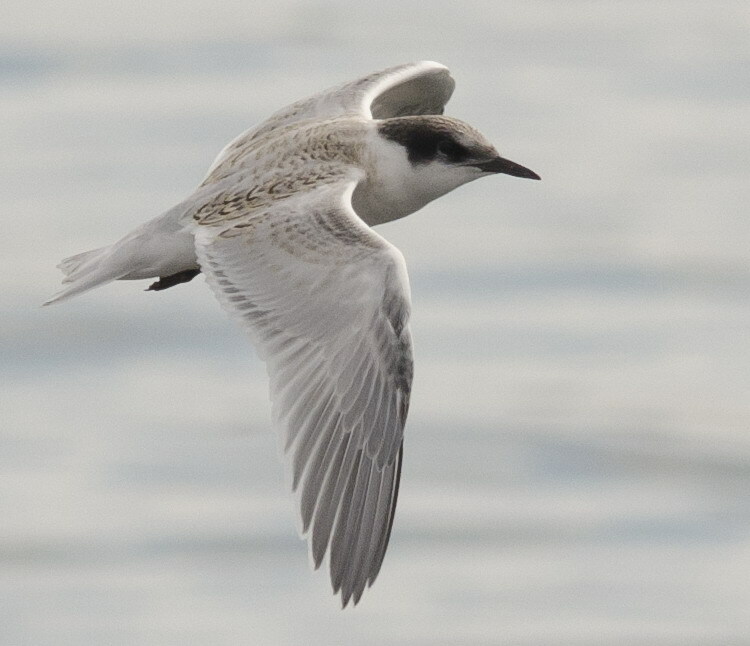 I just hope it is not waiting to fatten up on terns when they arrive. 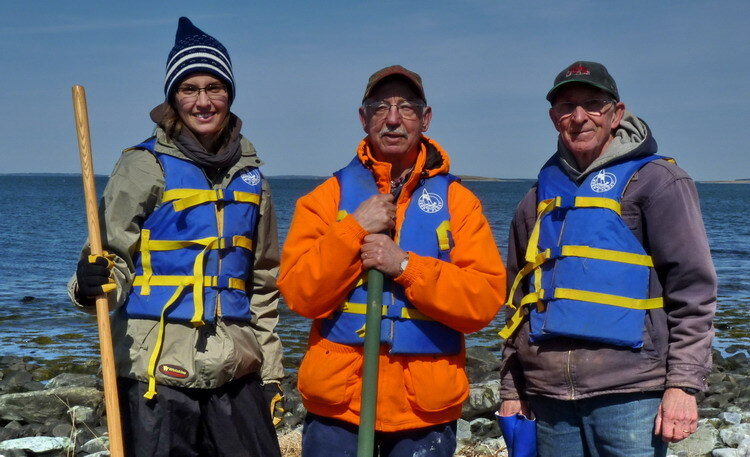 My crew and assistants again today were Rémi d'Entremont, Germain d'Entremont, and Hailey Heyens. April 30, 2014 - North Brother. Today, we tidied up the island a bit more. 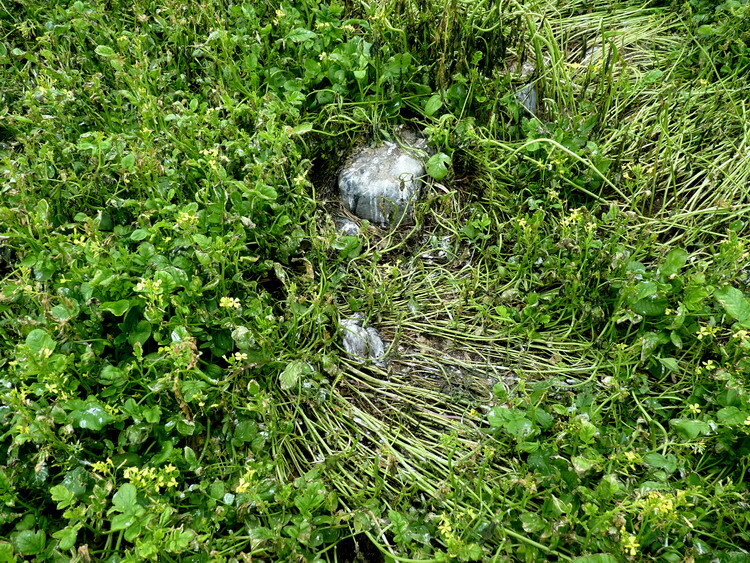 Some of the sprouting weeds were cleaned up from the Roseate Tern nesting area. 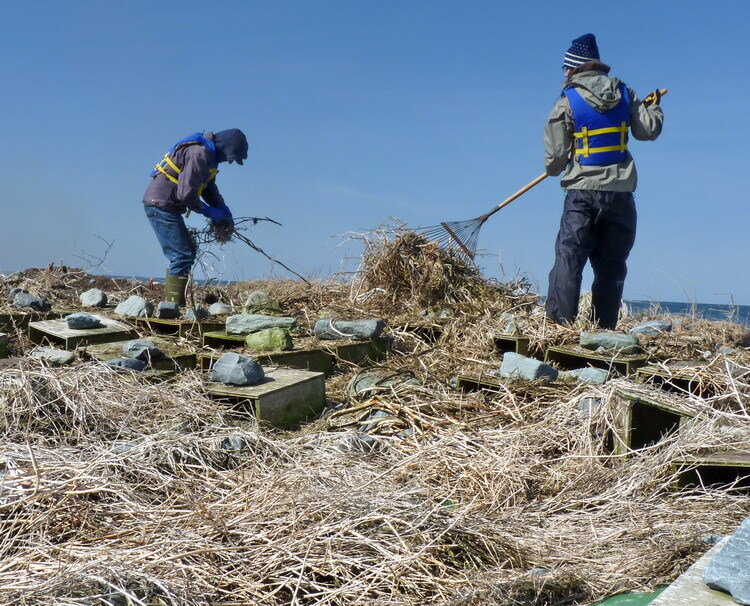 A couple of garbage bags full of plastic bottles was also collected and removed from the island. The Snowy Owl was nowhere to be seen, but a couple of Meadow Voles were spotted in the beach cobble. The grass transplants of April 2011 which had been expanding in area by 2013 are no longer to be seen. Much of the grasses had disappeared after the voles arrived on N. Brother during the fall/winter 2007/08. (Meadow Voles were first seen on S. Brother in April 2002.) I suspect the disappearance again of the grass was due to the proliferation of voles on the island over the winter. 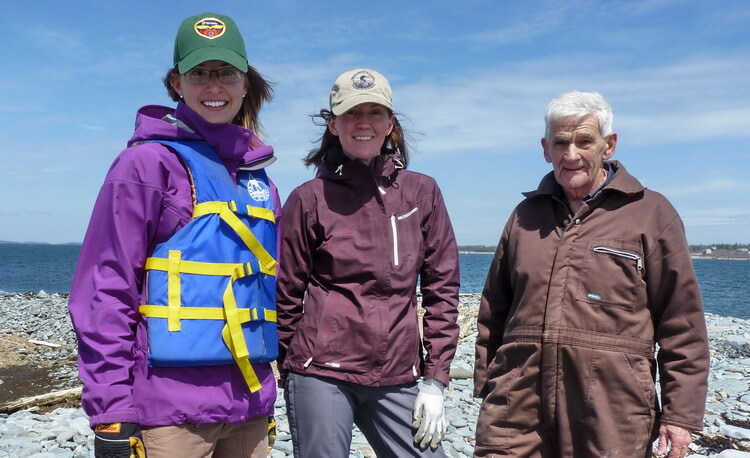 My crew and assistants today were, Julie McKnight (Biologist for the Species at Risk Recovery, Canadian Wildlife Service, Dartmouth, NS), Hailey Hayens (Biologist), and Aldric d'Entremont (Warden for the Municipality of Argyle). 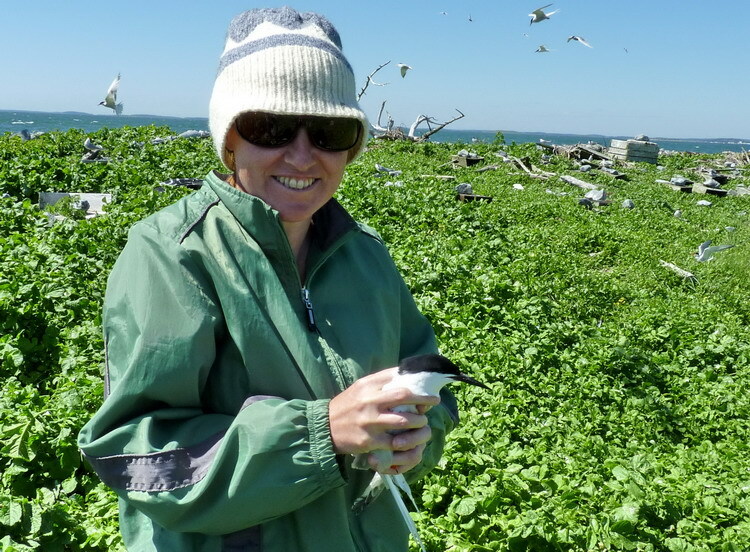 Julie is head of the Roseate Tern Recovery project. As far as I know, the terns have not yet arrived in the area. The lobster fishermen will let me know when they first see them. 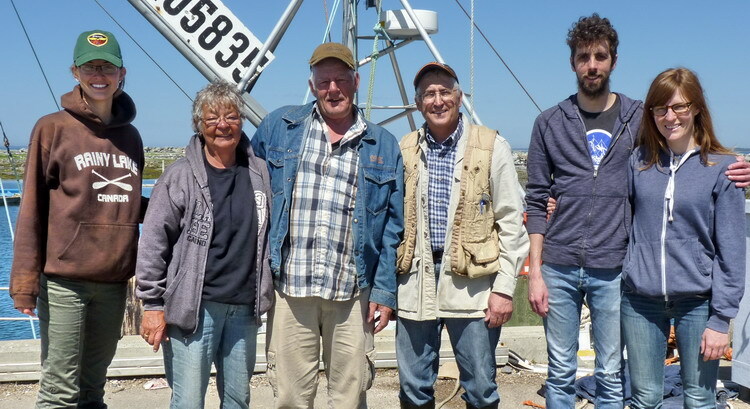 May 2, 2014 - The terns have arrived at The Brothers! Lobster fisherman, Franklyn Surette, reported seeing 5 or 6 terns in the air between The Brothers at 2:30 pm this afternoon. May 3, 2014 - This morning I reinstalled the IBA Interpretive Panel to its usual placement at the end of Pond Road, Lower West Pubnico. The site overlooks The Brothers, the islands being about 3/4 km away to the west. As a bonus, I could see and hear about 50 terns in the air above North Brother! This was at 9 am, May 3, 2014. May 7, 2014 - North Brother. About 100 terns greeted us as we arrived. The vast majority were Common Terns(COTE), but I saw one or two Arctic Terns (ARTE) among them as well as at least 4 Roseate Terns (ROST)! I don't ever recall seeing Roseates this early. I expected to see many more Arctics mixed among the Common Terns but they just were not there. We then motored to South Brother. Only a couple of gulls sitting on the highest point of land. I expected seeing perhaps a gull nest or two but we found none. A lone Great Black-backed Gull with a droopy, broken wing waddled to the shore and stayed there. There were no gull nests on either island. We also saw no signs of Snowy Owls. The "high land" of South brother has not changed much since last year. It is still about 5 metres wide at the widest and about 20 metres long. Not very big at high tide! 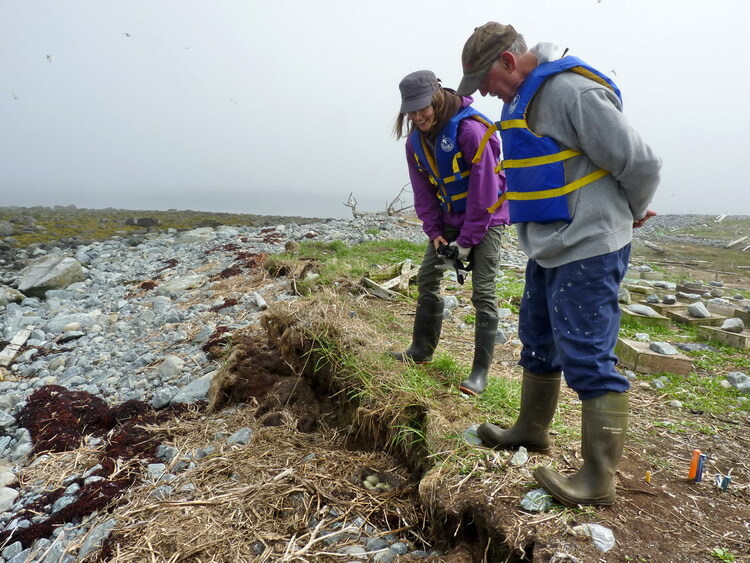 Our last goal of the morning was to check the eastern shoreline of Pumpkin Island, located about 6 km northwest of The Brothers. 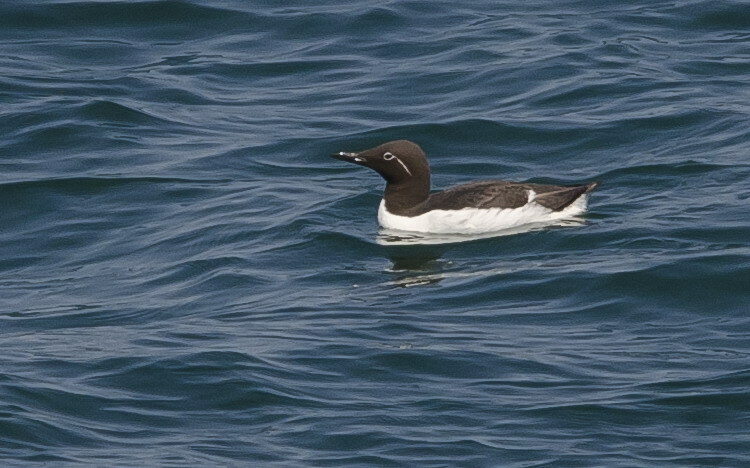 Last summer, I had seen Black Guillemots there on a couple of occasions. It would be a good indication of Black Guillemots nesting on Pumpkin if some were still there. And, yes they were! We counted at least six. They must be nesting on Pumpkin! 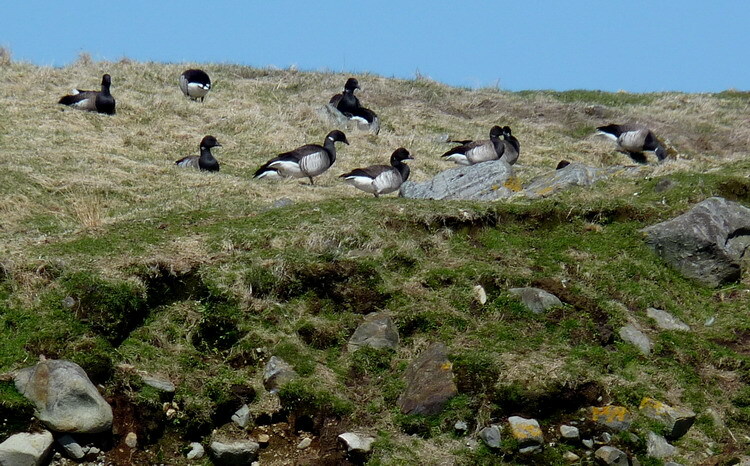 Another surprise on Pumpkin Island were the 75 to 100 Brant ("Pale-bellied Brant") grazing on the vegetation. That was a treat! 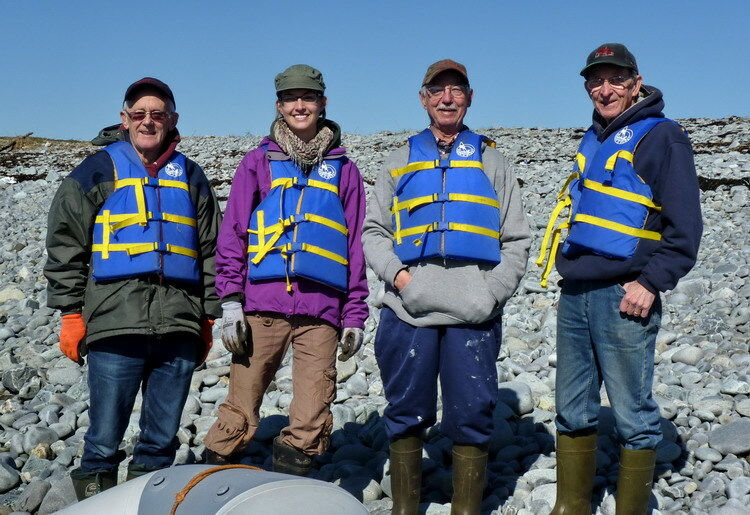 My crew and assistants today were, Rémi d'Entremont, Hailey Hayens, Germain d'Entremont, and Jean Bernard d'Entremont. 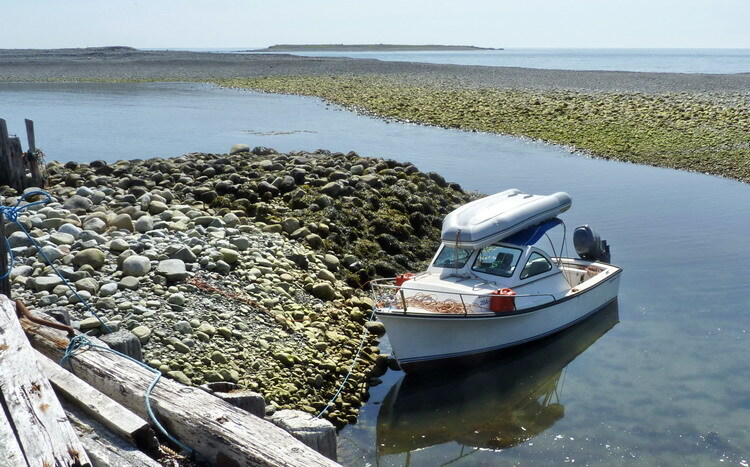 May 12, 2014 - The plan was to motor by N. Brother to check out the terns from the boat and then continue to "the Mud Islands" to check out the Puffins. We had no problem getting to The Brothers but about 1/3 the way to Round Island (our first scheduled Puffin stop) I decided to turn back as the water was getting too white and too rough. Lots of terns on N. Brother! Somewhere around 300. Still not many Roseates (I don't think I saw more than 3 at any one time), but I did see a few more Arctics than last time. My crew and assistants today were, Hailey Hayens, Jeremiah Niekamp, Ingrid D'Eon, and my grandson, Orson Deveau. May 22, 2014 - North Brother. About 300 terns in the air as we arrived. The terns are nesting! All THREE species! We estimated about 125 tern nests in total; mostly COTE, but 7 or 8 identifiable ARTE and 4 ROST nests. The ROST nests all contained a single egg and were all located in 16" x 16" nesting shelters. 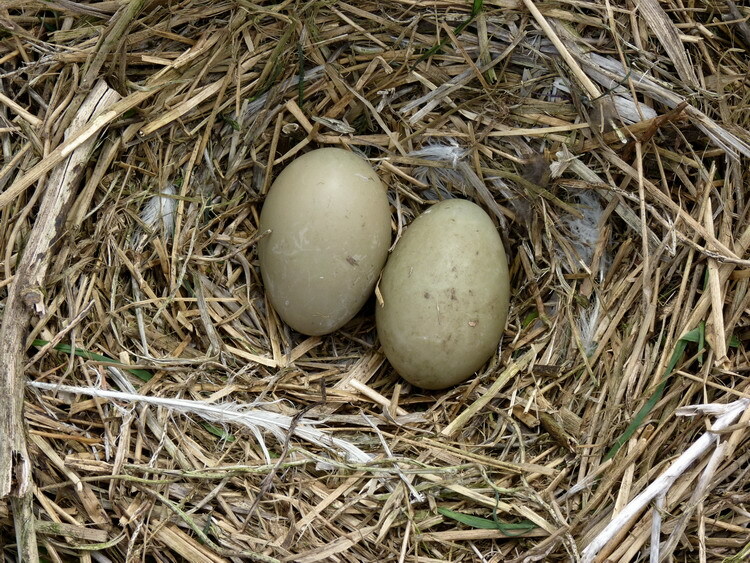 Also on N. Brother were 4 Common Eider nests with eggs. We found no gull nests on N. Brother. A couple of unusual COTE eggs. The first one was found broken open, but its shell was tissue paper thin and translucent. See photo below. 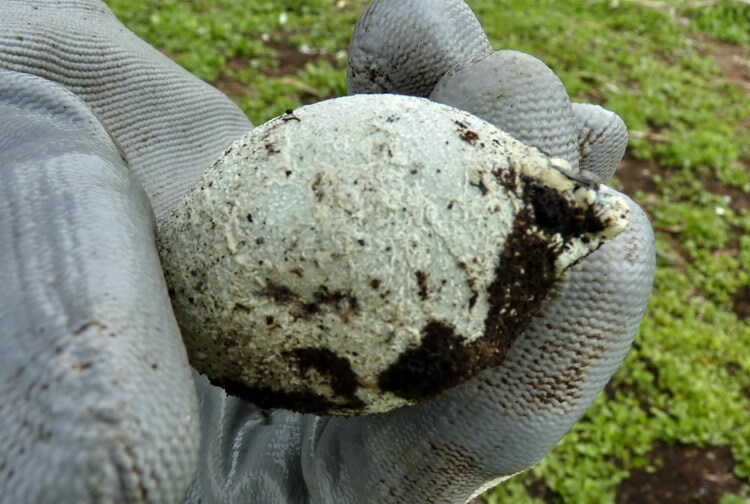 The second egg had a soft and rough leathery shell. Its contents appeared still intact. See below. A pair of Common Yellowthroats was observed on the beach. It was rather unusual to see warblers on N. Brother. Two or three Meadow Voles were seen scurrying on the island as we walked around. 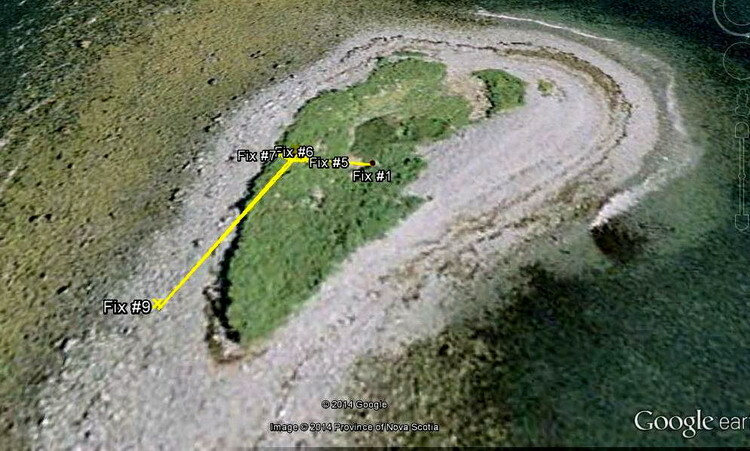 Then to S. Brother where we found two more Common Eider nests and 3 Great Black-backed Gull nests. The gull nests were destroyed. 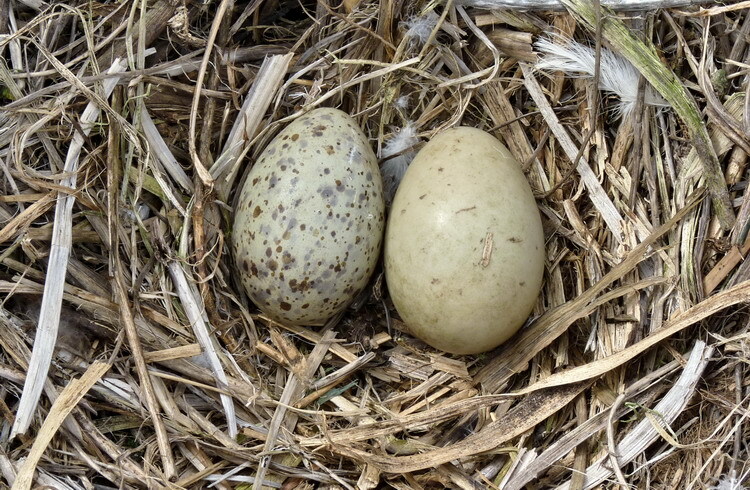 One of these contained one GBBG egg and one Common Eider egg. See below. 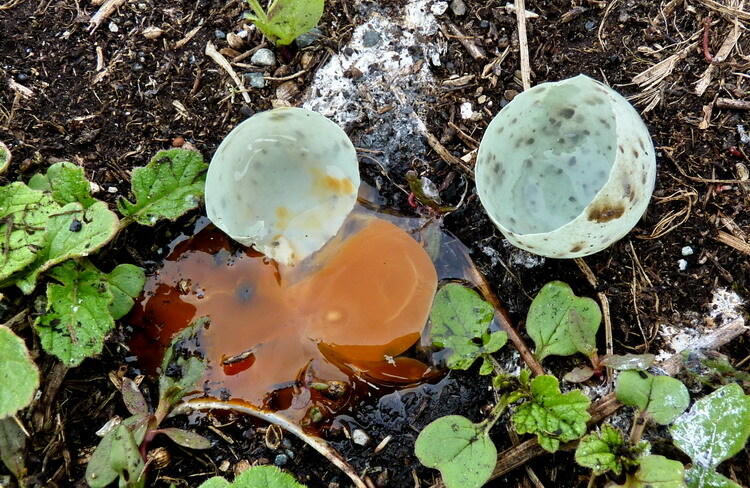 Another GBBG nest containing only two Common Eider eggs was not destroyed. My crew and assistants today were Rémi d'Entremont and Hailey Heyens. We had a great visit on The Brothers. May 24, 2014 - Cape Sable. 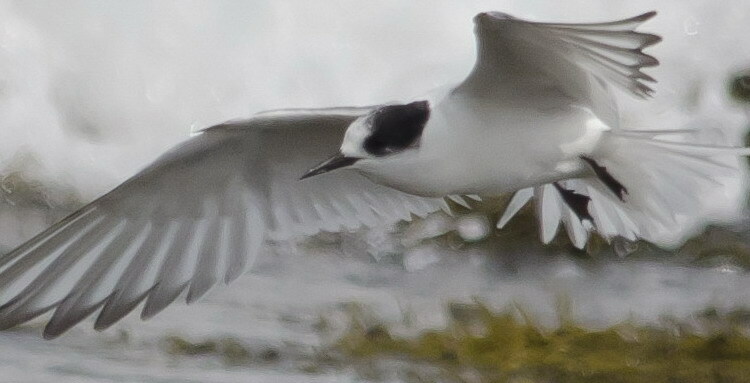 Ron d'Entremont reported seeing a single Roseate Tern near the Cape Light on Cape Sable, Cape Sable Island. 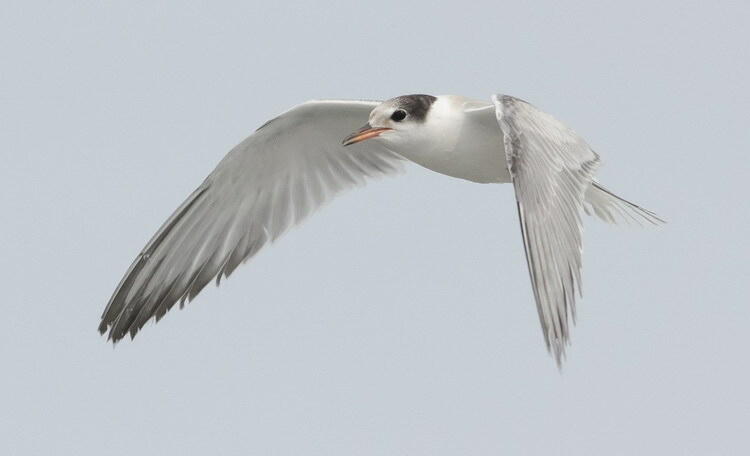 It was flying around with Common Terns. May 28, 2014 - North Brother. 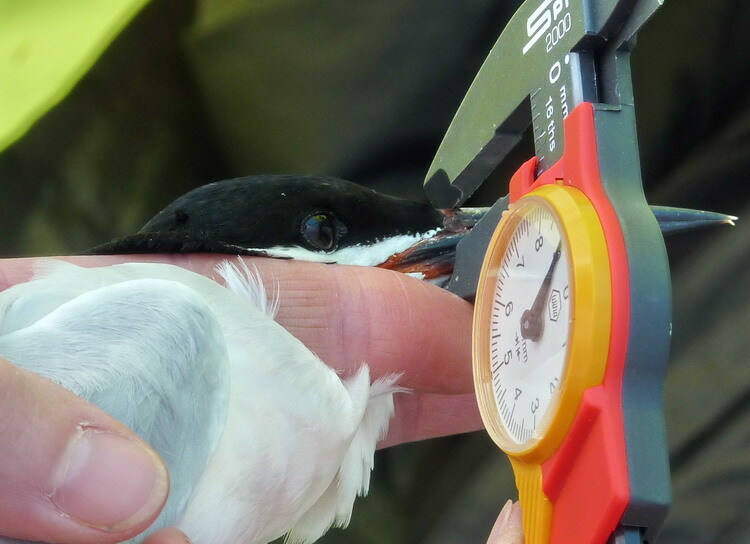 Today we placed numbered sticks on the 19 Roseate Tern nests we were able to locate. 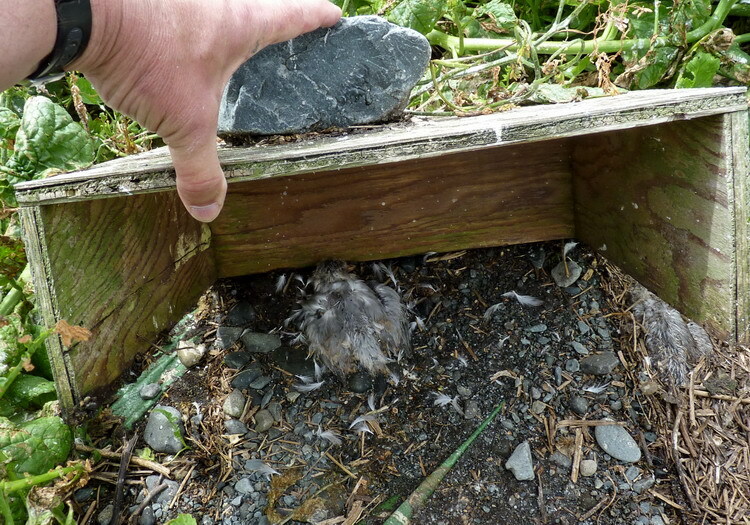 17 nests were inside my 16" x 16" nesting shelters; 2 were under propped-up plywood. Last year around this time the count was 15 ROST nests. Last year's total ROST nest count was 38 , so I expect at least as many this year or more. Hopefully more! Five of the nests contained two eggs; the remainder, one egg. Tern nests were everywhere; several hundred at least, but we did not even attempt to do a proper count. The colony appeared very vibrant and in great condition - the weedy vegetation still being only centimetres tall. We saw no predators. 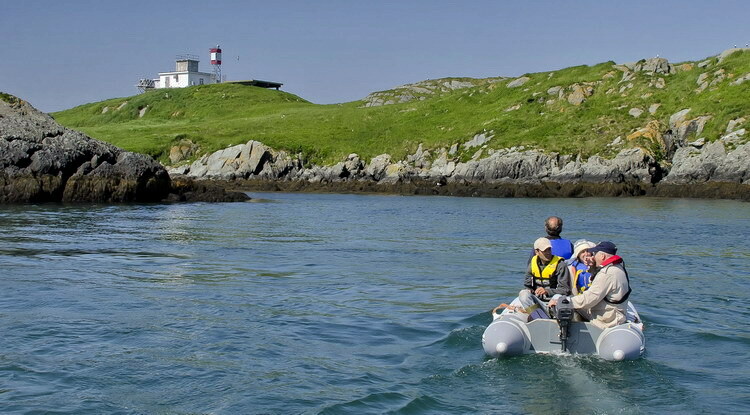 We then motored SSE 10 km to St. John's Island where ROST have been known to forage for fish. There were a few terns in the area but none that I could identyfy as ROST. 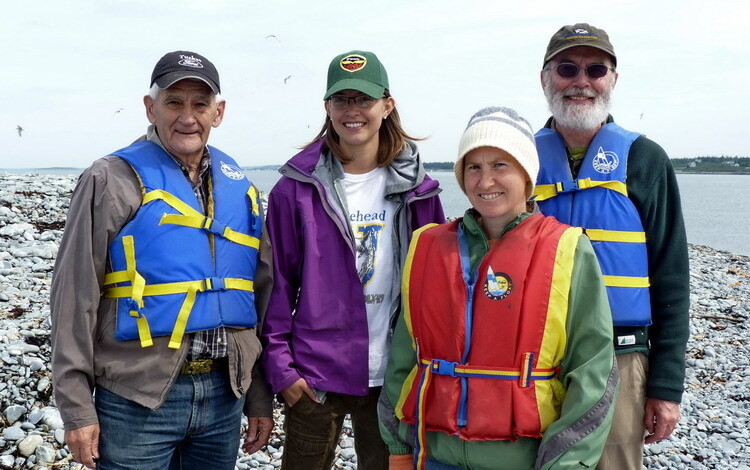 My crew and assistants today were Rémi d'Entremont, Hailey Heyens, Bonnie Hatfield, and Walter Niekamp. 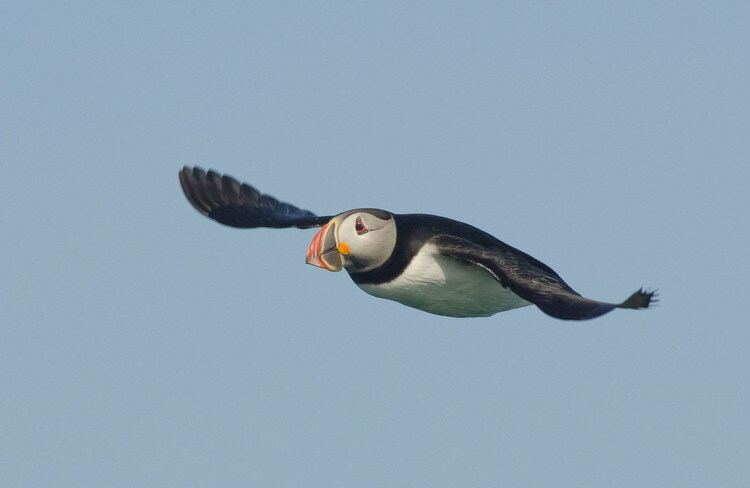 June 2, 2014 - Boat trip to "the Mud Islands" to check up on the Puffins and whatever else we might find. Before even getting to the islands we saw fly by, about 40 Brant. I don't recall seeing Brant in June before, so this was a treat. Also on the way, we saw a small pod of Harbour Porpoises. Another treat! At Round Island, we were greeted by 50 to 60 Black Guillemots and perhaps 20 Puffins in total (difficult to get an accurate figure). 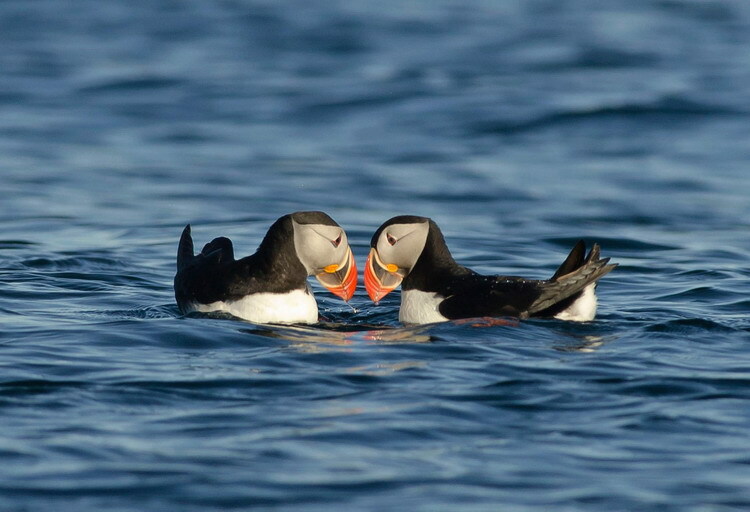 We estimated another 7 or 8 Puffins at the northeast corner of Mud Island and abour 15 at Noddy Island. 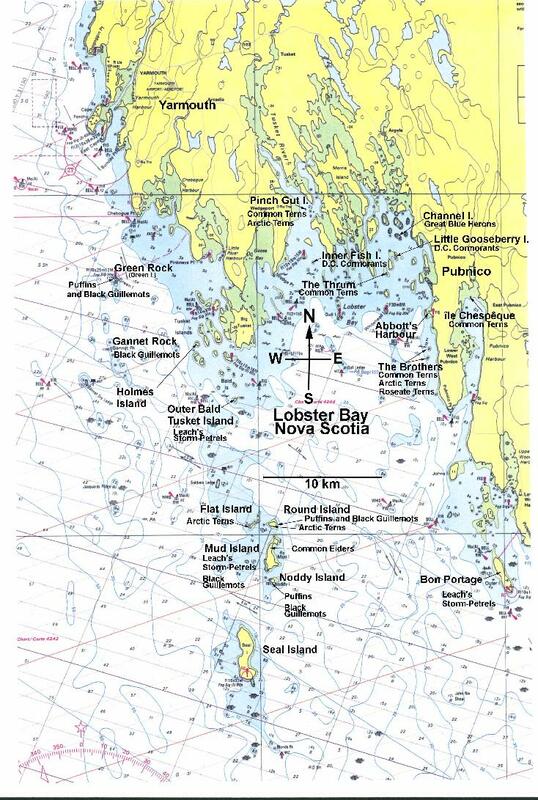 We then proceeded to Flat Island where we went ashore and explored for a little over an hour. Of the birds we saw on Flat Island were Black Guillemots, a small number of Arctic and Common Terns, less than usual number of Common Eider nests, some Great Black-backed Gull nests, a Raven or two and a Black-crowned Night Heron. We could not locate any tern nests, but there had to be some. 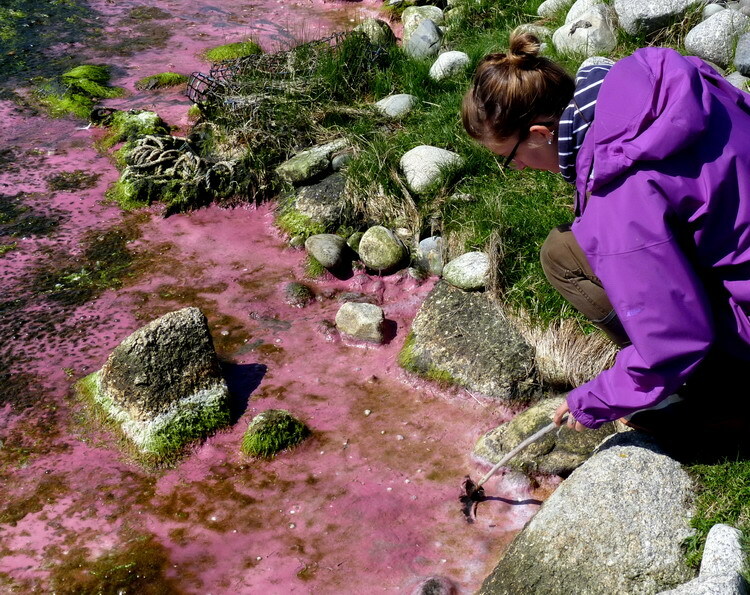 The photos below show some type of pink growth found on the mud at the edge of the pond on Flat Island. It was the same colour as "Pepto-Bismol" (a common medication in Canada for diarrhea and stomach problems). It was a semisolid layer a couple of millimetres thick laying over the black mud. Don't know what it really was. 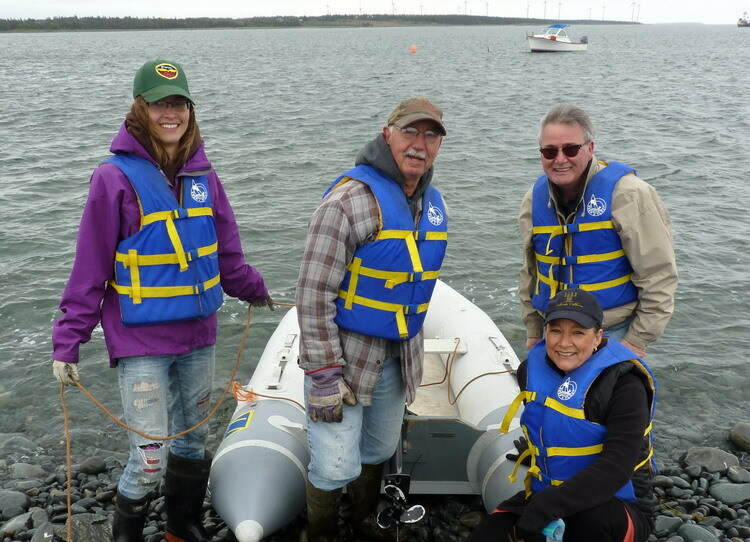 My crew today were Rémi d'Entremont, Hailey Heyens, Ron d'Entremont, Ingrid D'Eon, Orson Deveau, and Margie Rogers. I think we all had a wonderful morning. June 3, 2014 - Île Chespêque, Pubnico Harbour. 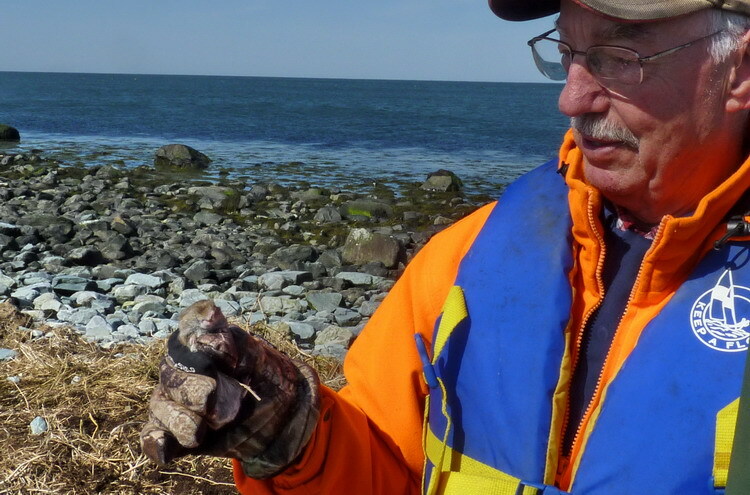 David Surette reported counting 50 tern nests (116 eggs) and 21 Common Eider nests (80 eggs) there today. This is a very large number of Common Eider nests for the size of the island! 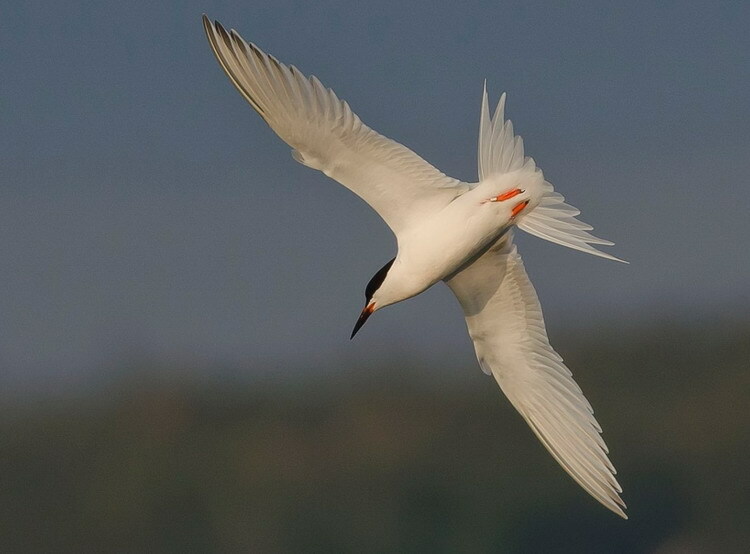 From recent history of the island, the terns would be all or almost all Common. David visited Île Chespêque with wife Annis, son Justin, and Justin's girlfriend, Amy. June 8, 2014 - North Brother. 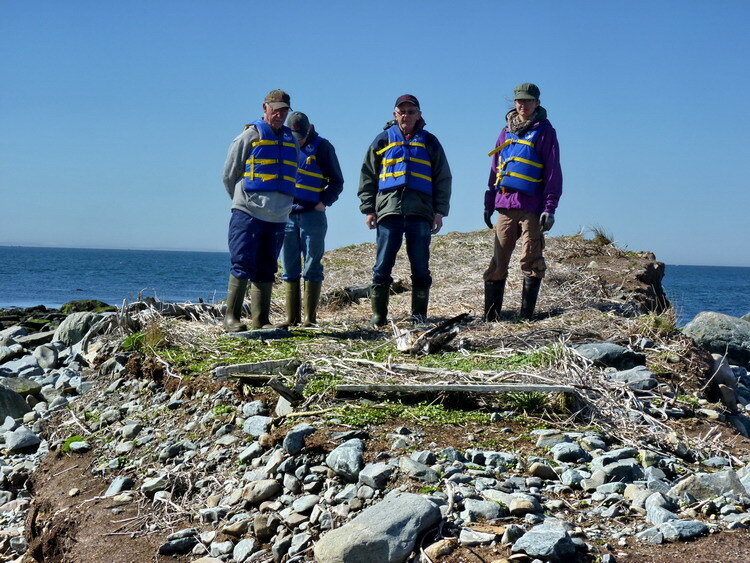 This morning, we checked out the island for new ROST nests and to update the contents of the ones we already had. We are up to 36 ROST nests now! 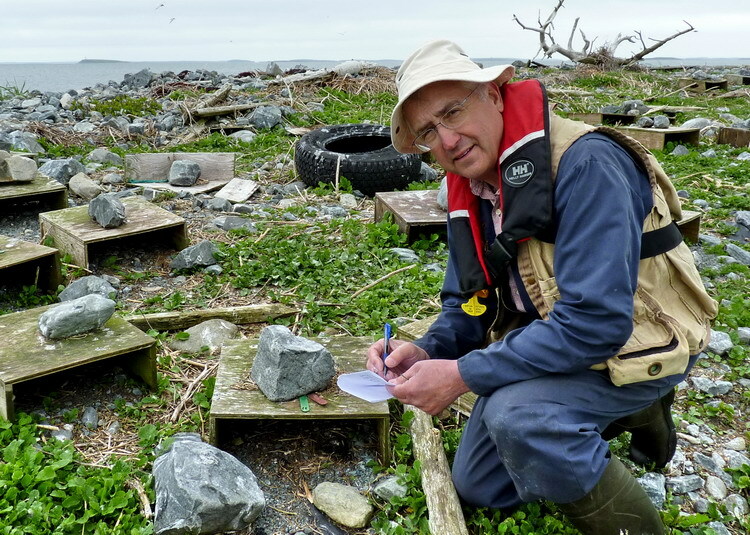 We also counted 44 identifiable Arctic Tern nests in the beach cobble. I am sure there are a few more than that. My crew and assistants today were: Hailey Heyens, Laverne Caul, Bill Caul, Gavin Maclean, and Ingrid D'Eon. June 9, 2014 - North Brother. The official nest count day. It was a beautiful and comfortable morning. The count went really well and our numbers are up! We counted a total of 731 tern nests! This is the highest number since 2003. 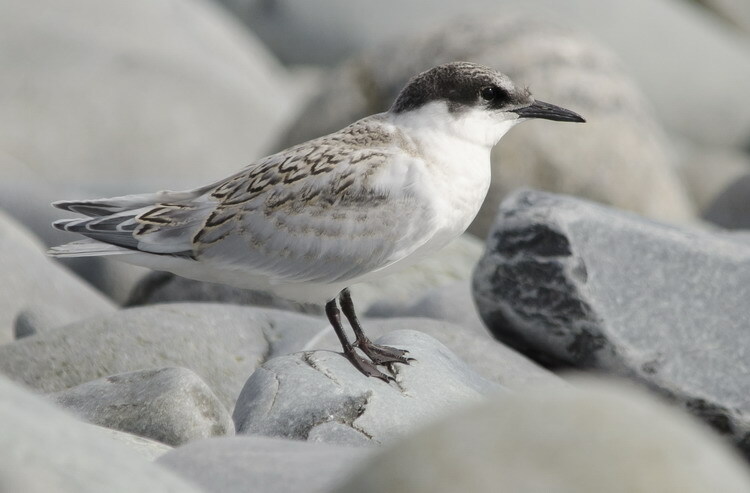 The 731 included 37 Roseate Tern nests and at least 44 Arctic Tern nests. We also counted 7 Common eider nests on N. Brother - 2 with four eggs, 4 with five eggs, and 1 with six eggs. 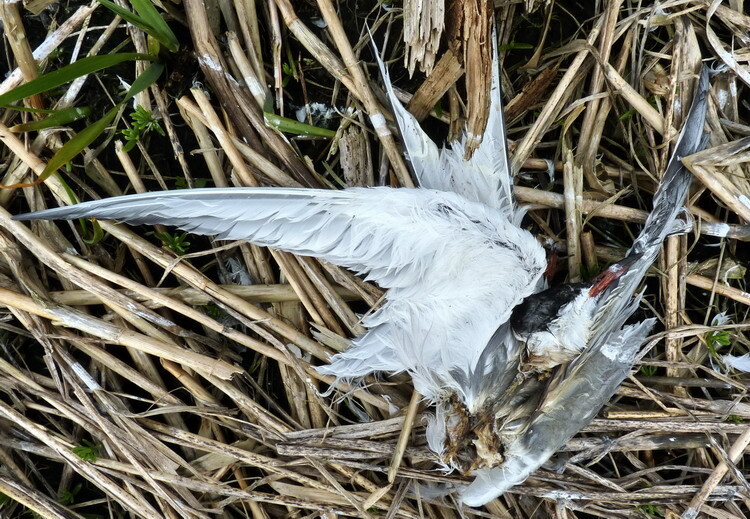 Of concern were the three Common Tern carcasses we found on the island today. One of these was headless. I suspect owl predation on two of them. 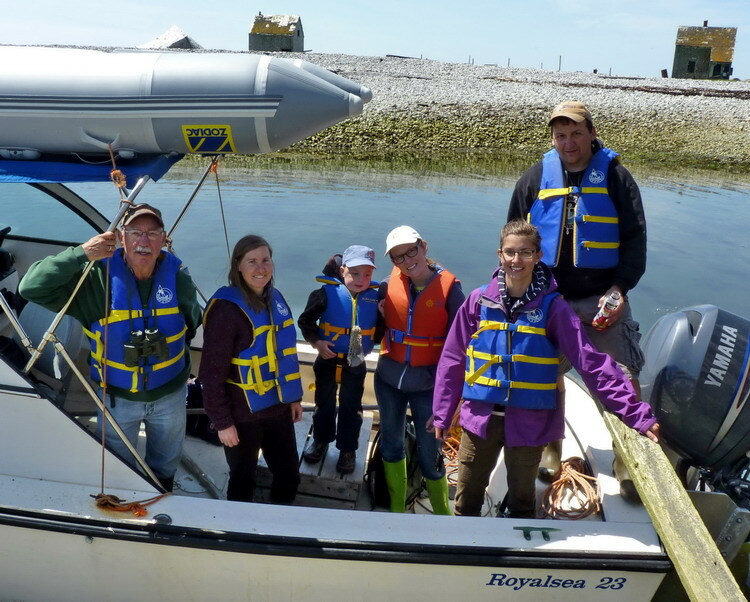 My crew and assistants today were: Hailey Heyens, Duncan Bayne, Aldric d'Entremont and Margie Rogers. They all did a superb job. A sincere thanks to them all. June 12, 2014 - North Brother. 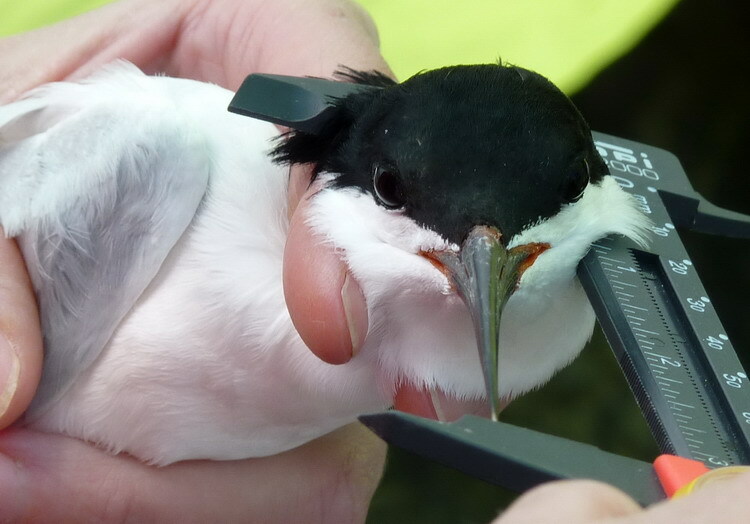 Today, GPS tagging of six adult Roseate Terns. I would be assisting the five biologists I brought to the island. 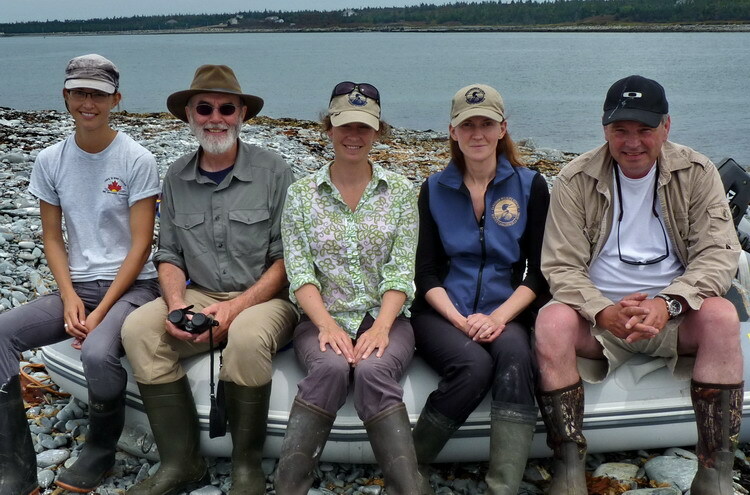 These included Julie McKnight, Karen Potter and Karine Duffy from CWS, Duncan Bayne from Nova Scotia DNR and Rob Ronconi, a postdoctoral research biologist doing some freelance work (I think) for CWS. 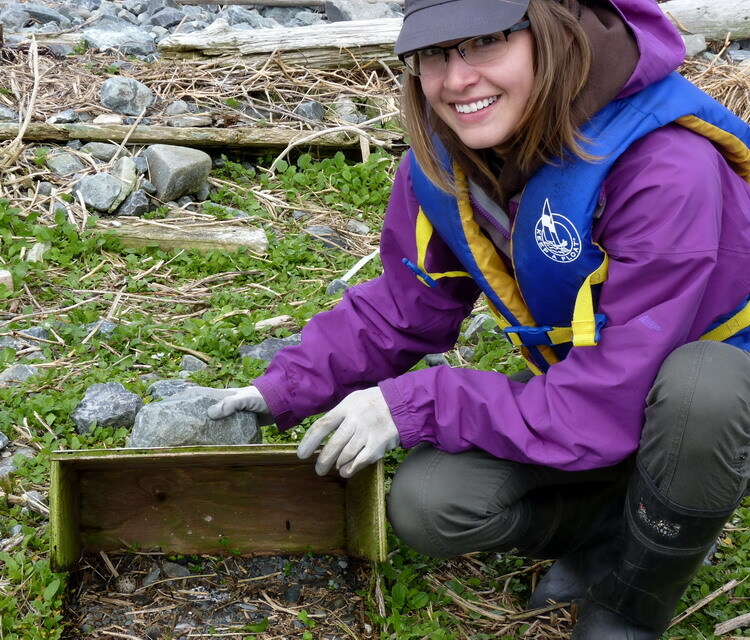 Julie is the Species at Risk Recovery biologist in charge of the Canadian population of Roseate Terns. I believe Rob had used this type of tags before on other birds but this would be the first time for anyone to try them out on terns. 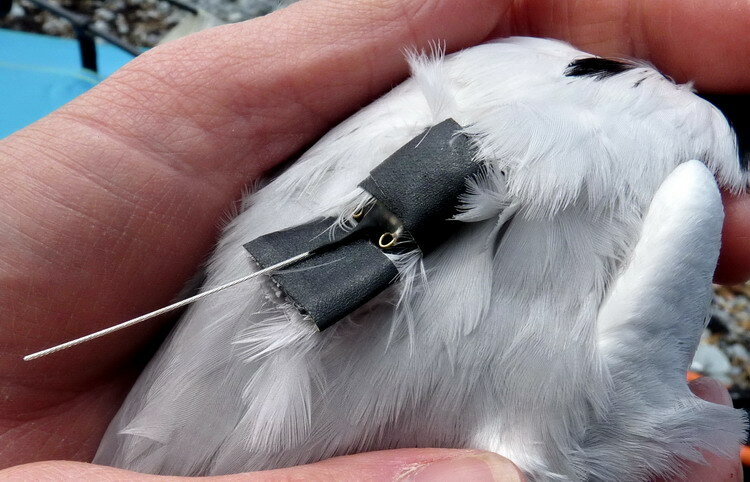 The GPS tags will be placed (glued to feathers) on the backs of the adult terns. 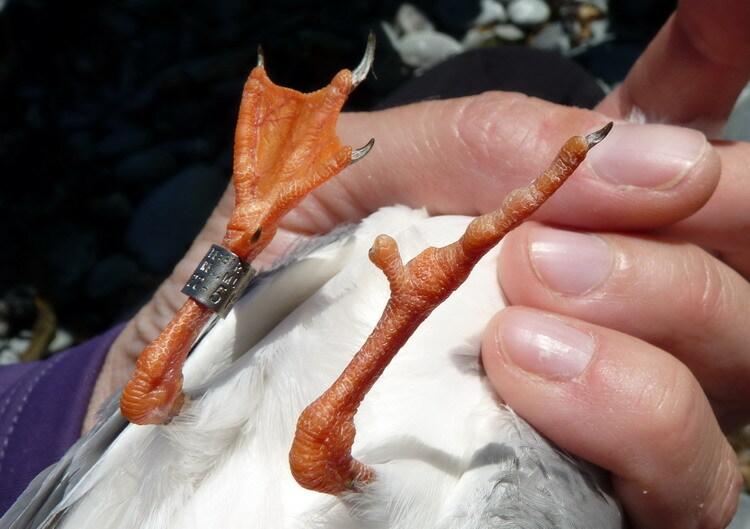 The tags only record data and do not transmit, so the birds will have to be recaptured within a week or two to retrieve them. 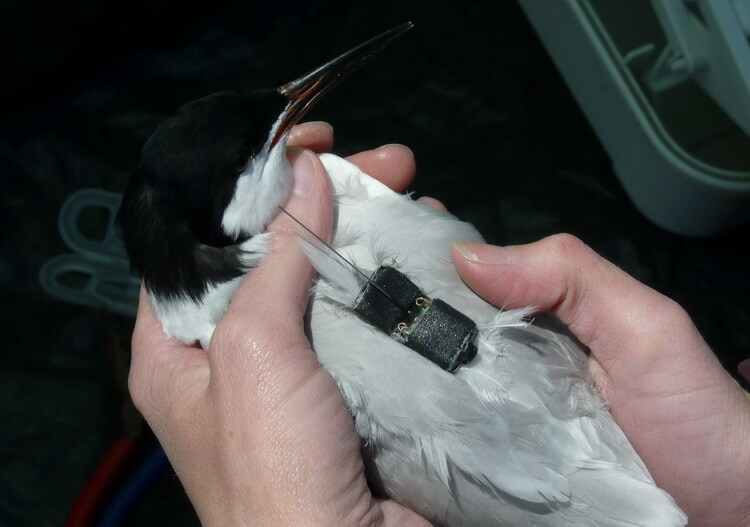 The data extracted from the tags will hopefully tell us where the Roseate Terns forage for the fish they bring to the island. 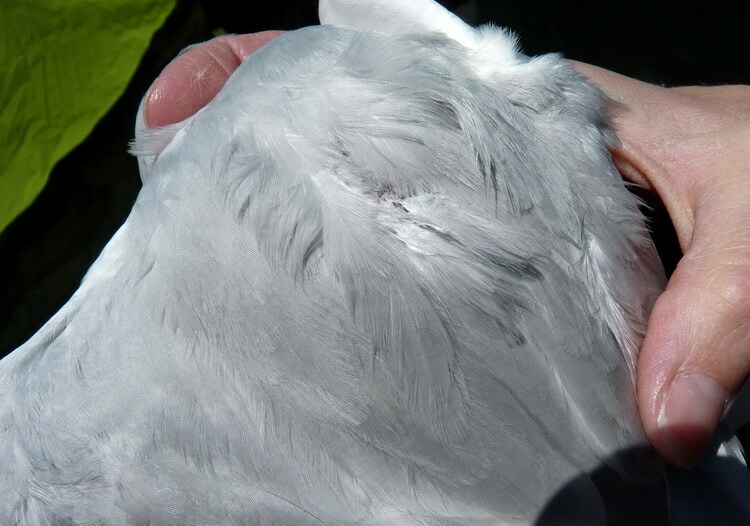 After the capture - the weigh-in, measurements taken and banding if required before the GPS tag is secured to the bird. The tagging session went well and now to see if we can get the expected foraging data. 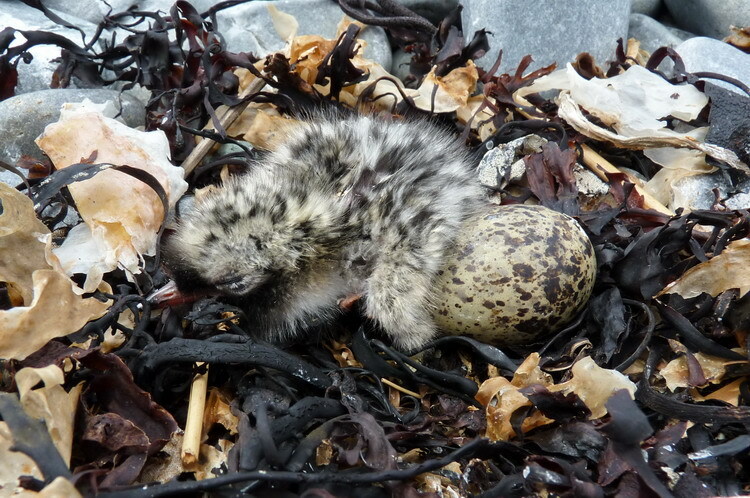 Common and Arctic Tern eggs were starting to hatch! June 17, 2014 - North Brother. Today, the plan was to try to recapture the GPS tagged ROST and deploy up to 4 more tags. We would also band any unbanded adults we capture. We may have failed our objective in that we were only able to recapture 3 of the six tagged birds and we were only able to deploy one more GPS tag, but we were still pleased with what we accomplished. 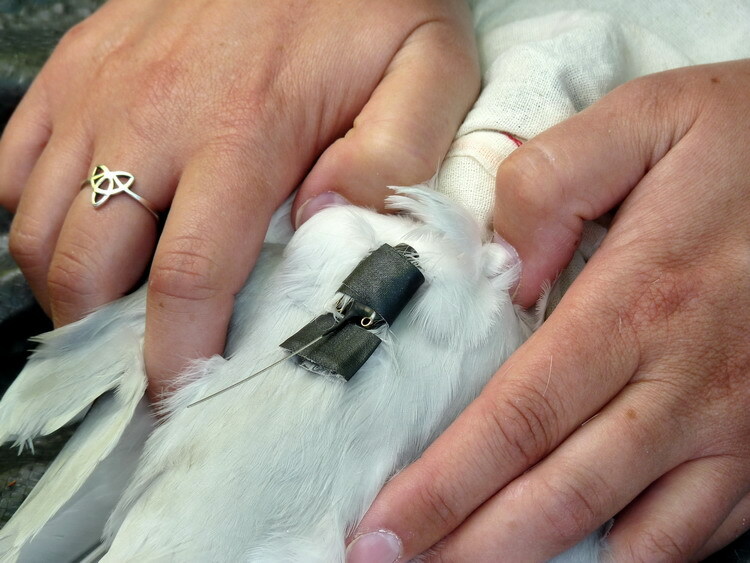 Three other adult ROST were captured and processed (weighed, measured, and banded if they were unbanded). Two of them were captured unbanded. 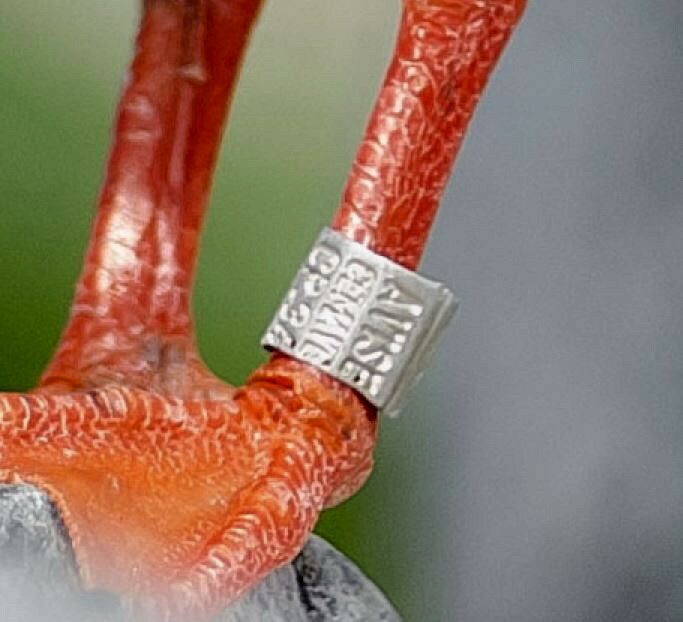 Of major disappointment to us was that two of the three recaptured tagged ROST had lost their GPS tags since deployment on June 12. 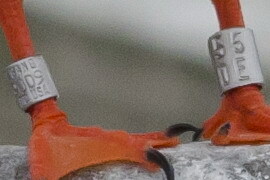 The ROST which was still tagged had it hanging by a few small feathers. (see below). 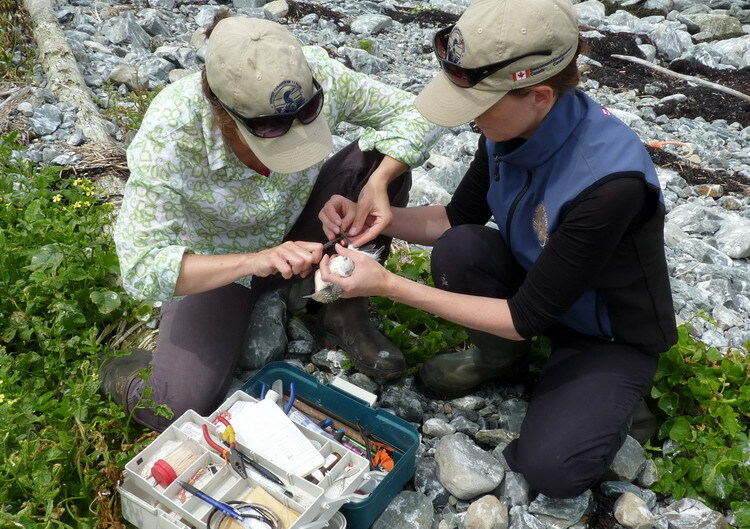 CWS biologist, Julie McKnight, had brought her computer to the island and so was able to read the GPS tag. The results were disappointing. 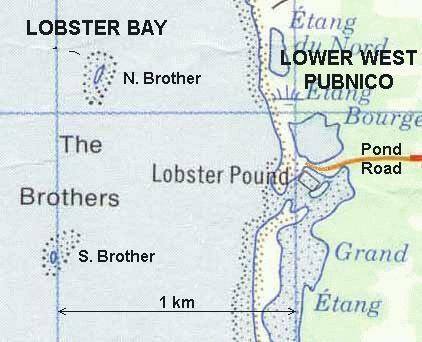 All the collected data points were at North Brother (see below). 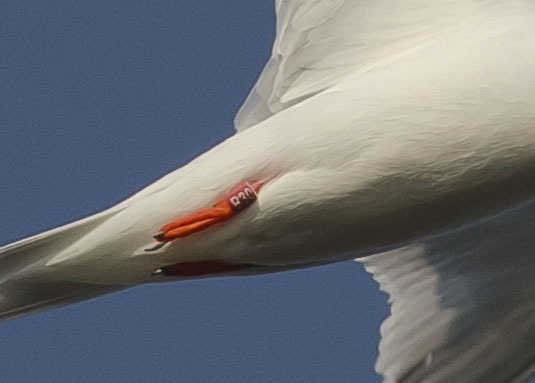 One of the adult ROST we captured today had a hole in the web of its foot (see below). It was well healed and did not appear to pose any difficulty for the bird. 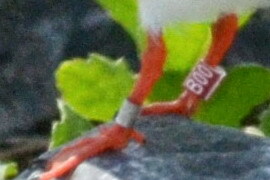 I got out my camera with the long lens to see if I could read any field readable ROST leg bands. I got two B00 and B04. I will return to the island within the next couple of weeks on a day where I can concentrate on getting more leg bands. Today was not the day for this. Oh, and I almost forgot to mention. We located two more ROST nests. 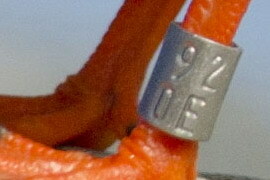 Our ROST nest number now stands at 39 ! We only had the time today to check some of the nesting shelters. I am pretty sure we will get a few more when we do our next ROST nest count. The crew today were Julie McKnight, Karen Potter, Hailey Heyens, and me. June 19, 2014 - North Brother. 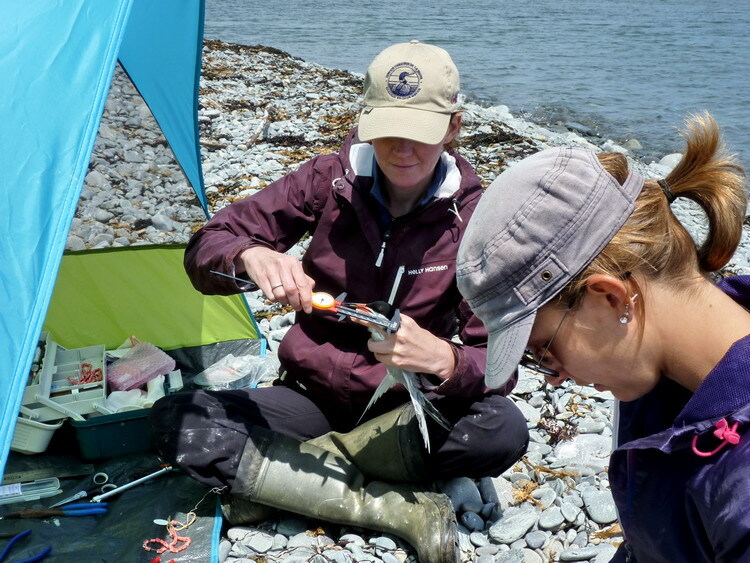 More adult ROST trapping and banding. We captured six adult ROST but failed to recapture any more of the GPS tagged ROST from June 12. 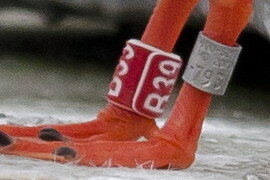 Five of the birds captured were unbanded and subsequently banded with red plactic field-readabled on the left leg, and the long-numbrered metal band on the right. 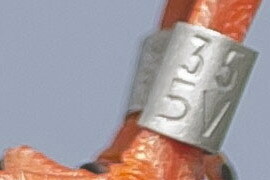 The other captured ROST had been previously banded on North Brother. I tried again to get photos of field-readable bands from the adult ROST. I remained too far from theM to get photos good enough to read the metal Field Readables. We were just too busy trapping. 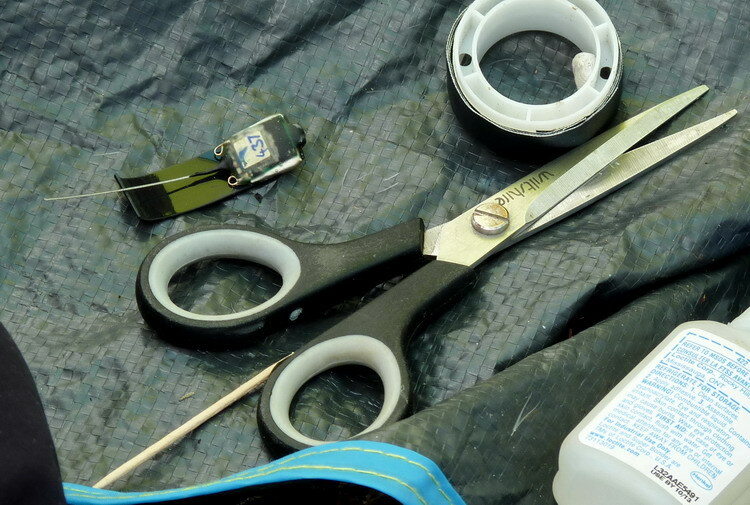 I will return to N. Brother within the next week or so with another photographer just to photograph MFR (Metal Field Readable) and PFR (Plastic Field Readable) leg bands. I am afraid I misidentified a Common Tern nest as a Roseate. The two eggs looked Roseate and even though it was in the open, it was next to a log. I was pretty confident it was a ROST nest and listed it as so. But alas, the hatch chick looked COTE and later I saw an adult COTE sitting on the nest. We are back to 38 ROST nests again. Sorry about that. The crew today were Julie McKnight, Karen Potter, and Margie Rogers. 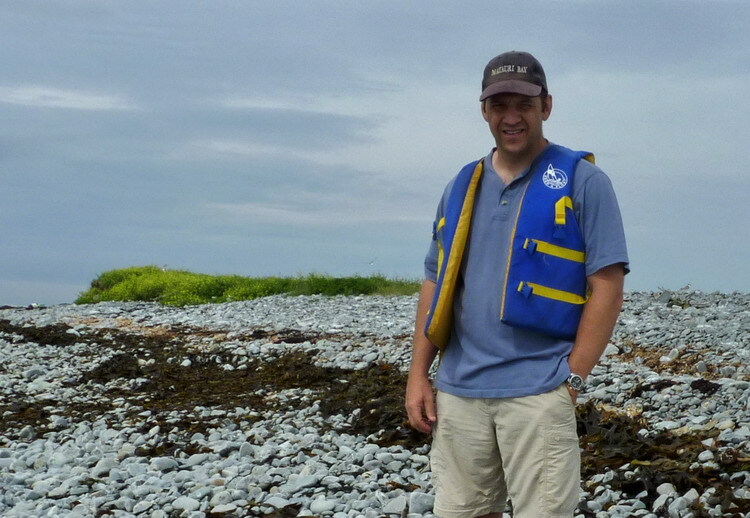 June 22, 2014 - Green Island, Nova Scotia (near Clark's Harbour, Cape Sable Island - 43.420 N, 65.677 W). 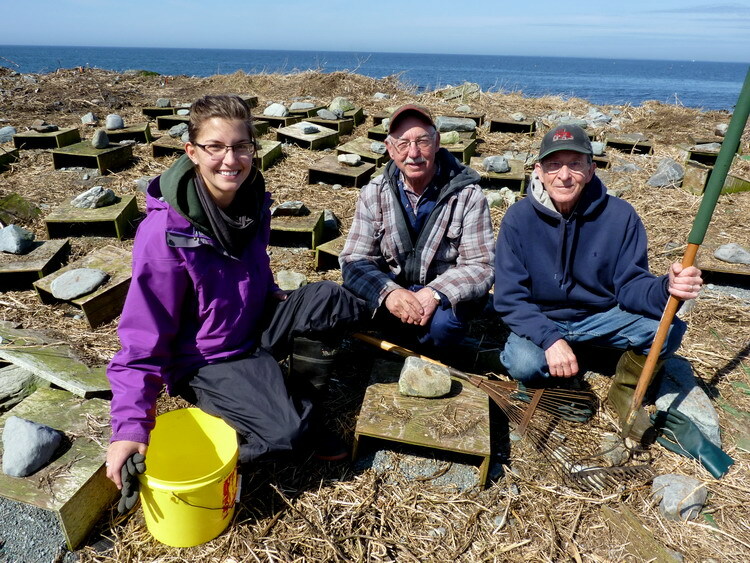 A report from Ronnie d'Entremont, Alix d'Entremont, and Bertin D'Eon: They estimated 30 Puffins, 50 Black Guillemots and 70 Arctic Terns there today. June 23, 2014 - North Brother. 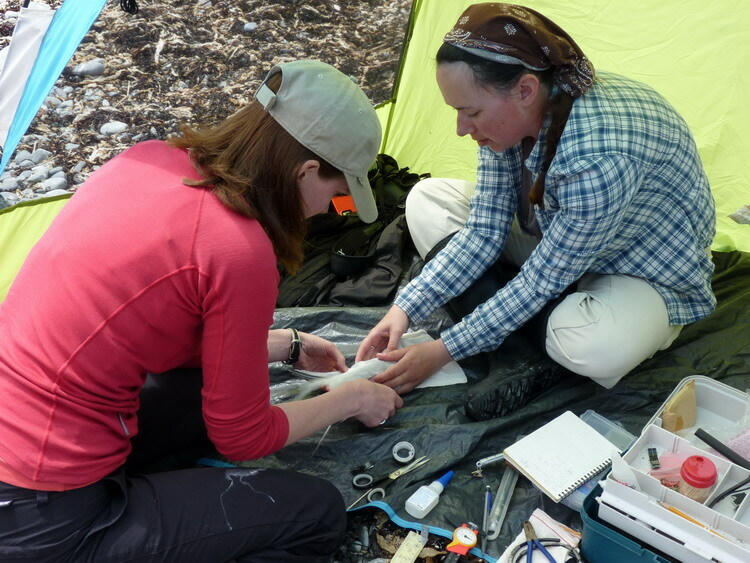 More adult ROST trapping and banding. We captured and banded another five adult ROST. 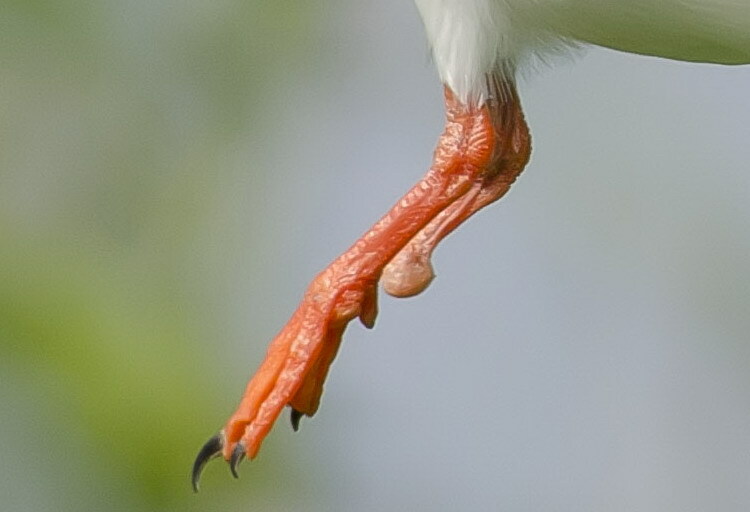 One of these terns had suffered at one time from a severe injury to its left foot. Possibly caught at one time in fishing line or something similar. (see photo). It appeared to be coping well with the injury. 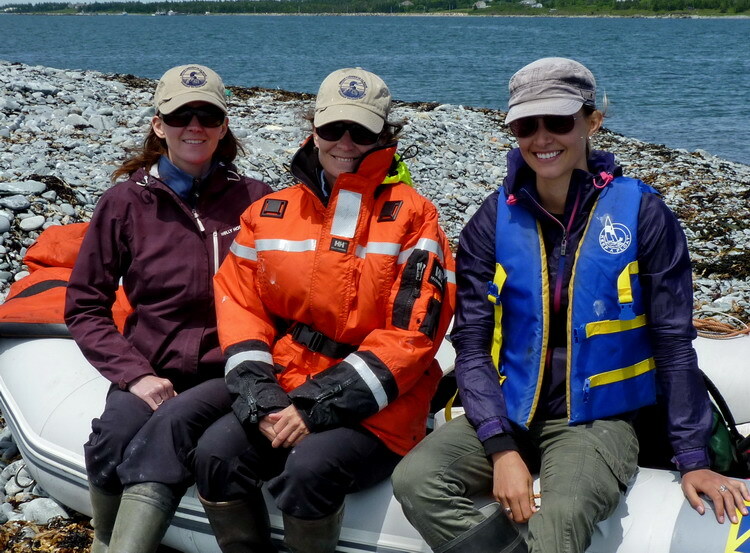 The crew today were Julie McKnight, Karen Potter, and Manon Dubé. 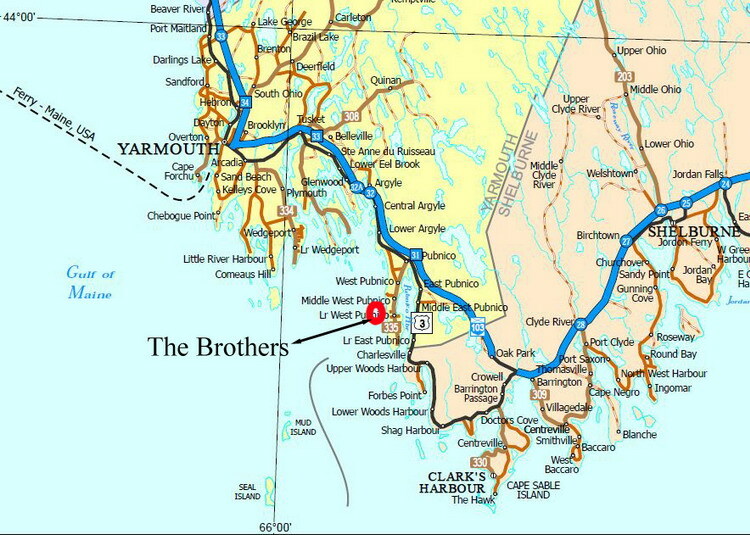 June 24, 2014 - North Brother. 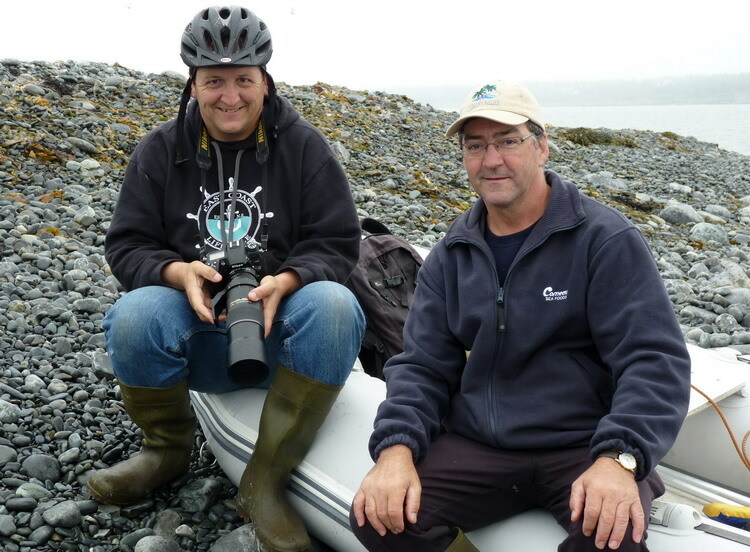 Today, I brought with me to the island, Ronnie d'Entremont, an exceptional local bird photographer (and a good friend of mine). 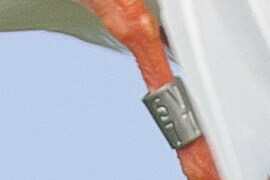 We were able to read five metal field readable (MFR) leg bands which had not seen before yet this year. I got the first one shown below; Ronnie got the other four. Another of the ROST Ronnie photographed had a different style of metal band. 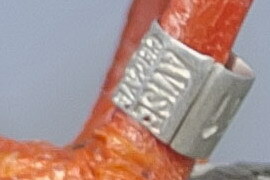 I can read "AVISE". Likely not from around here. Jeff Spendelow tells ne that the "AVISE Cemave" band is from Brazil. See photos below. Ronnie also photographed a ROST with a club foot. This was one of the adult ROST we captured by trapping last year on June 20. See photo below. Thank you, Ronnie, for a job well done and truly appreciated. June 29, 2014 - Off to explore a couple of islands. 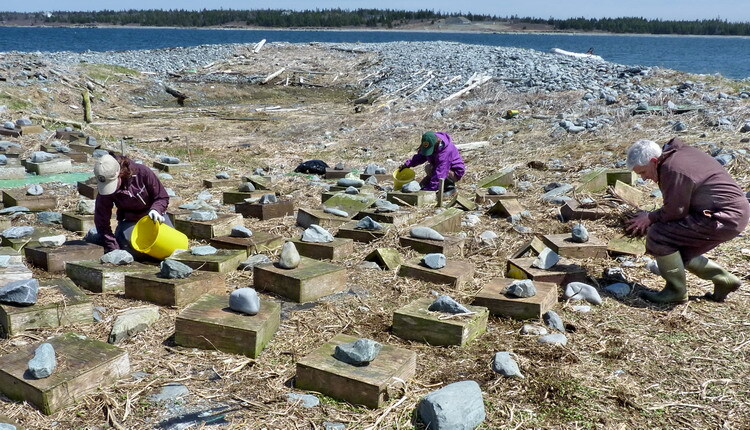 Our first stop was Outer Bald Tusket Island. Check out the Principality of Outer Baldonia. 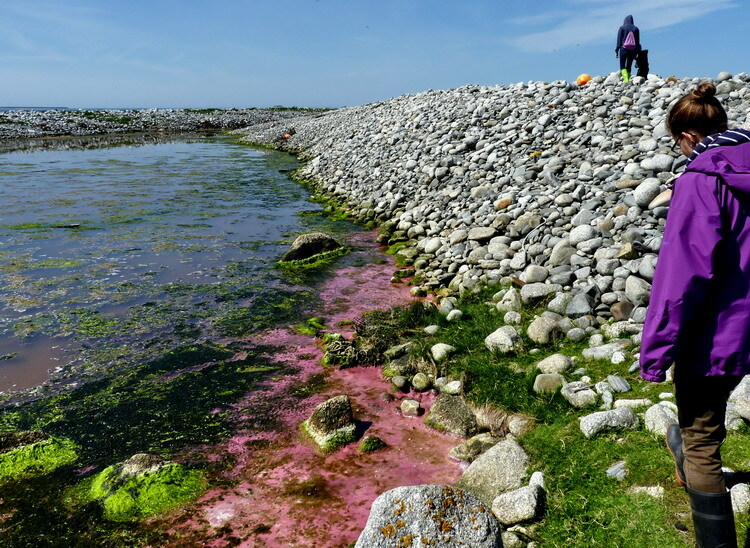 This island has had a very colourful history. Since 1973, it has been owned by the Nova Scotia Bird Society. The "Outer Bald" had not changed much since my last visit there 2 or 3 years ago. We sort took a census of the bird life we found there. 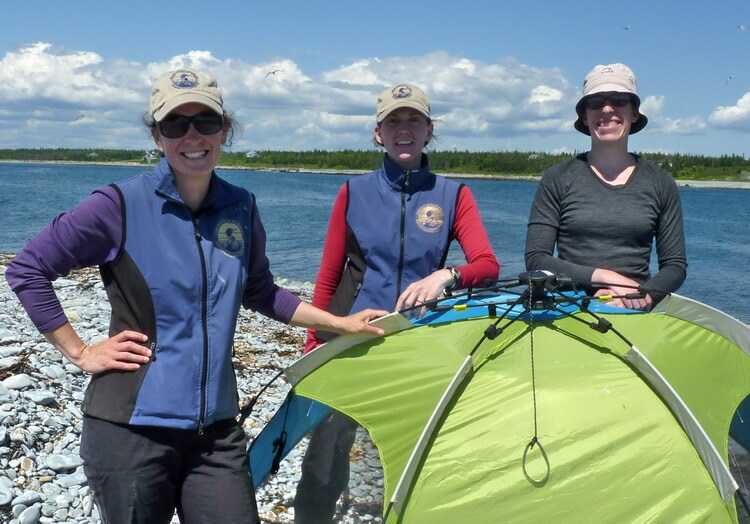 We then motored by the three other "Bald" islands owned by the Nova Scotia Bird Society but didn't see much there except for a Double-crested Cormorant colony of between 60 to 100 nests at the northwest corner of Little Half Bald Tusket Island. 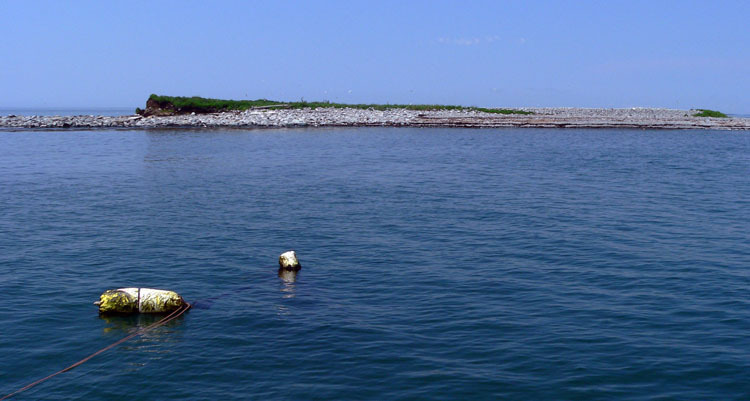 A couple of years ago, there was a Double-crested Cormorant colony of about 100 nests on Inner Bald Tusket Island. We did not see any cormorant nests there this time. 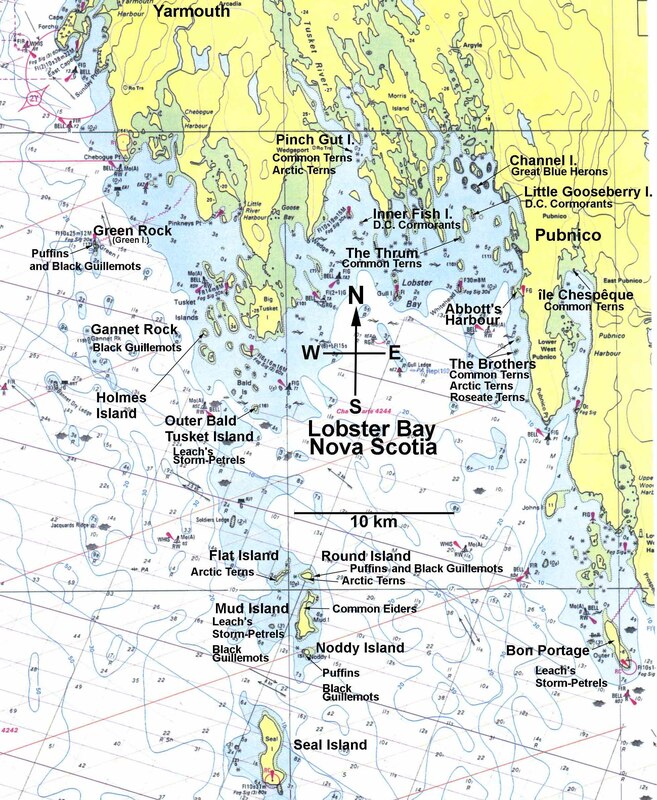 After the Bald Tusket Islands we headed northwest for another 12 km or so to Green Island, also known locally as "Green Rock" (43�41'21"N 66�08'36"W). This is for me the most facinating island of Yarmouth County. It has a great variety of bird life. Long known for its Puffin colony, Green Rock is the only place I know in Southwest Nova Scotia to have a Razorbill colony. The Razorbill numbers have grown from 1 or 2, twenty years ago to the 150 or so we estimated today. Of special interest today were (1.) a Northern Gannet sitting and preening with the D-c Cormorants at their nesting site and (2.) 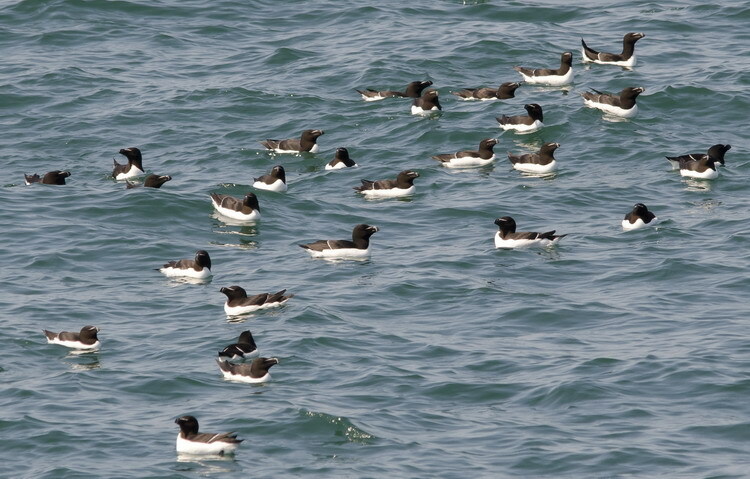 two Common Murres bobbing on the water with the Razorbills. This was my first time ever to see either gannets or murres at Green Rock. It was a pleasant surprise. 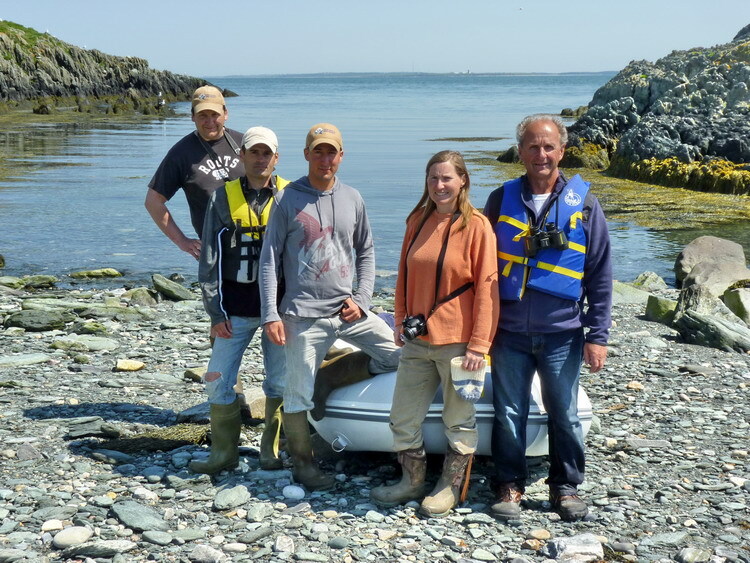 My crew today: Ronnie d'Entremont, Alix d'Entremont, Bertin D'Eon, Lester D'Eon, and Margie Rogers. We all had a superb morning! July 8, 2014 - The winds calmed down enough around 10 am this morning for an impromptu visit to North Brother. There was a lot of swell, but very little white water. 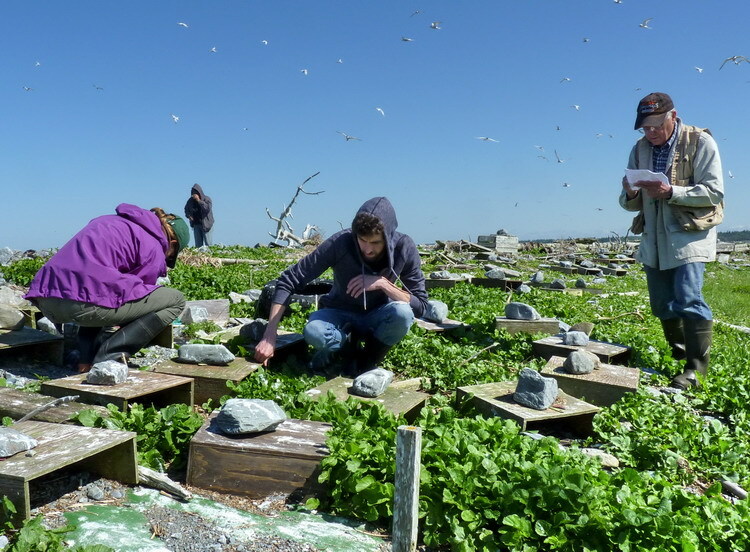 We were not sure what would be left of the tern colony after post-tropical storm, "Arthur". Arthur had hit the province very hard and had uprooted trees everywhere. Some households still had no power a several days after the storm. I had viewed the island from the mainland yesterday and it looked busy as usual with terns but I knew the colony had been hit hard. 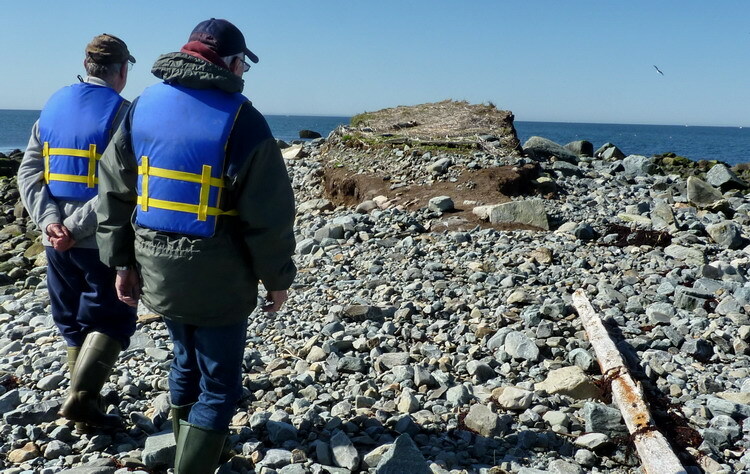 Thousands of birds were brought to Nova Scotia by Arthur. Most of them were Laughing Gulls (thousands) but there were also dozens of Black Skimmers and at least four species of terns not normally seen in Nova Scotia at any time of the year. Ronnie d'Entremont and his brother Ellis were with me and they brought with them their telephoto cameras. 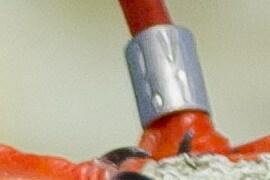 We would see if we could photograph a few more ROST leg bands. I also brought with me a change for the memory chip and batteries for the trail camera. What we found: Not total devastation even though there was plenty of carnage. A lot of dead chicks on the beach and in the vegetation. Many were quite well feathered and within a week or so of flight. However, there were also lots if live chicks being brought food by their parents both on the beach and in the vegetation. A lot of the food being brought in by the ROST and COTE were Sandlance (I did not observe what the ARTE were bringing in). Some of the Sandlance were quite big. I did not see any dead ROST chicks. Some of the nesting shelters were empty. The vegetation was not well searched for ROST chicks. 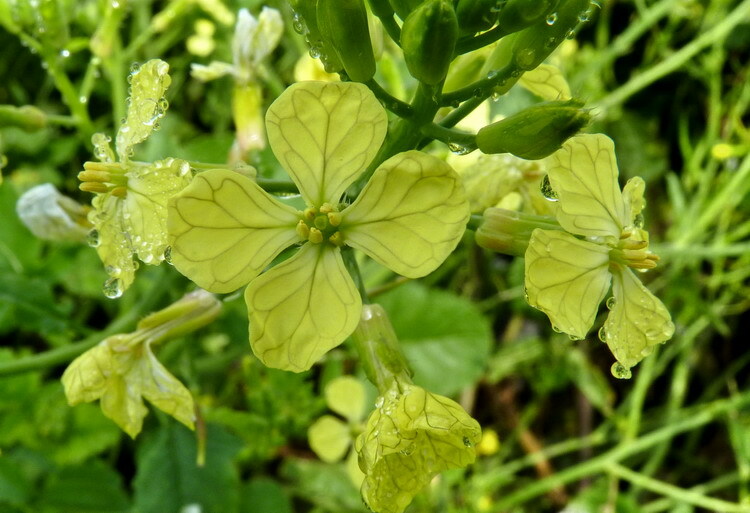 The storm had flattened areas of Wild Radish; most of the island's vegetation had suffered greatly from the storm. 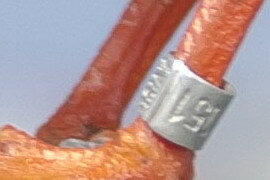 We did get two ROST leg bands which had not been yet documented this year. 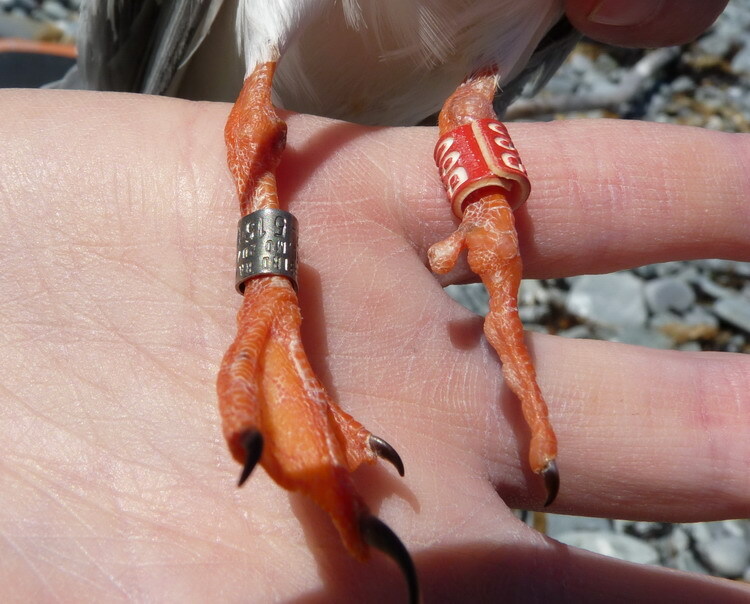 Both birds had been banded on North Brother - B39 as an adult in June 2013, and 550E as a chick in July 2005. July 11, 2014 - North Brother. 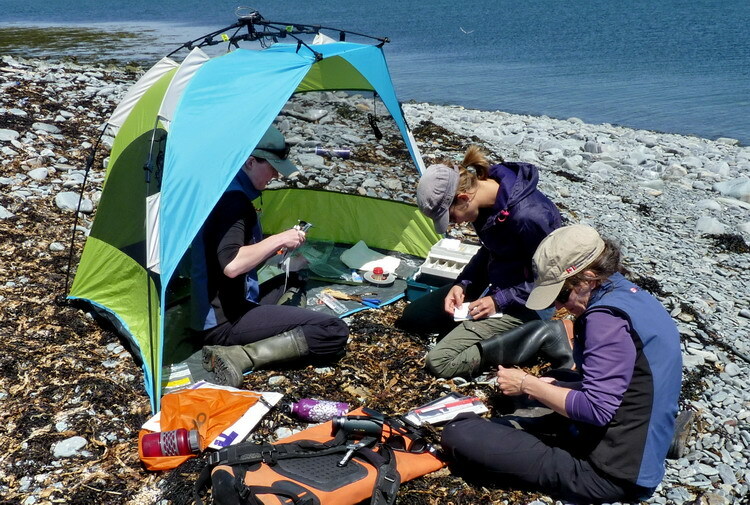 Roseate Tern Chick Banding Day! 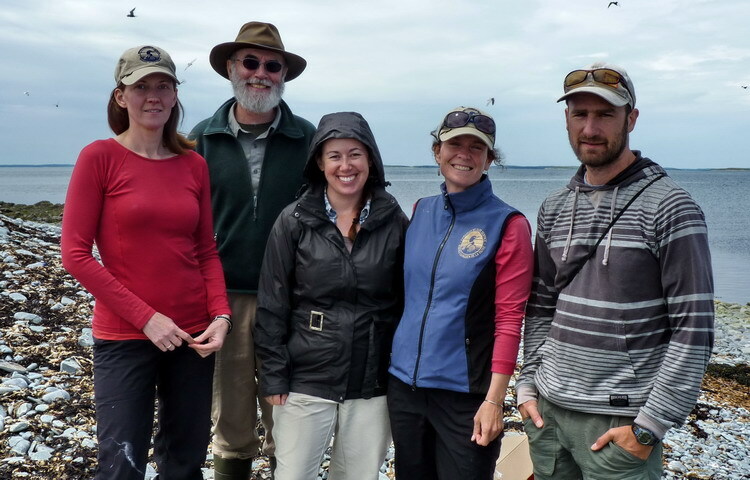 Today, Hailey Heyens and I, with NS Department of Natural Resources biologists, Duncan Bayne and Mark Elderkin, assisted CWS biologists, Julie McKnight and Karen Potter with the banding. Julie and Karen did the actual banding. 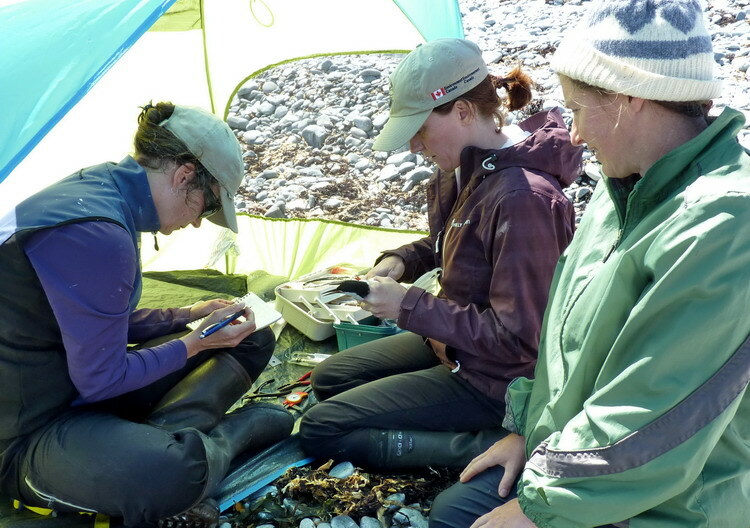 The rest of us helped by searching the ROST nesting areas for chicks, and bringing them to the banding station. 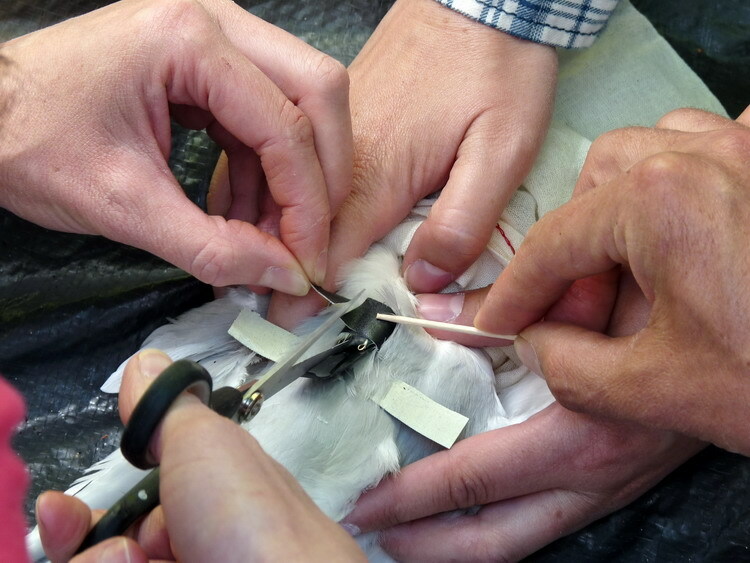 In total, 16 ROST chicks were banded. 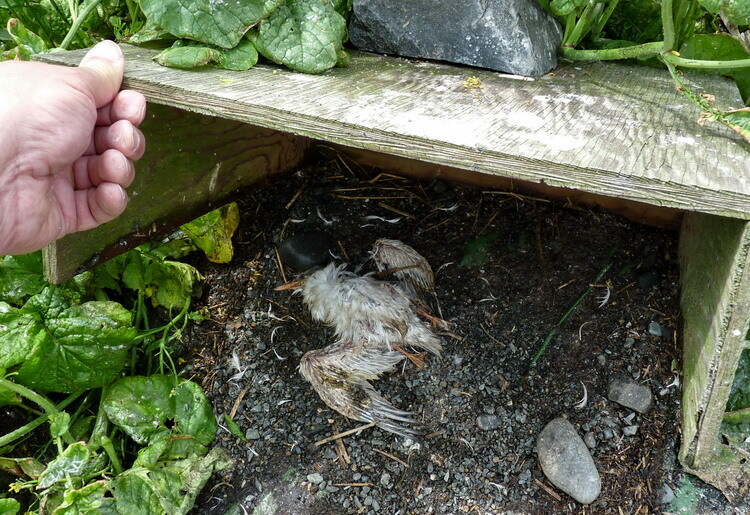 Very few ROST chicks were found dead, however, many Common Tern chicks were found dead inside ROST nesting shelters. Far too many, in fact (See photos below). I suspect these wet COTE chicks were seeking shelter during post-tropical storm, Arthur, and died there. I don't ever recall seeing this many dead COTE in the ROST shelters. Many had also died on the beach and in the vegetation. There was also a strange occurance today on North Brother while we were busy banding the chicks. We saw this small motorboat coming from the north. I waved to it and the two occupants waved back. We never thought anything of this until we saw one of the men walking along the shore of the island. I asked him who he was and told him the island was a preserve with access to it from April to September or October by permit only. He may have given me his name but I don't recall. He said he was doing a seaweed survey for Tidal Organics and they were going to survey South brother also. I told him the other island was also a preserve and they should keep 250 metres away. A short while later we observed the both of them walking on South Brother. To be fair to them, I didn't introduce myself so he may not have had a clue who I was, so why listen to me, but just about everyone in the area knows me and of my work with the terns. Just thought this should be noted. July 21, 2014 - Pubnico Harbour. Roseate Tern feeding frenzy around high tide at 7 pm, below the Inshore Fisheries fish plant in Lower West Pubnico! Up to ten ROST at a time with some COTE. I even saw a recently fledged ROST flying there also. A few ROST headed west in the direction of The Brothers with fish in bill (after a bout of catch-and-swallow). It is very unusual to see ROST in Pubnuco Harbour. The fish they were catching looked like Herring. July 27, 2014 - Pubnico Harbour. 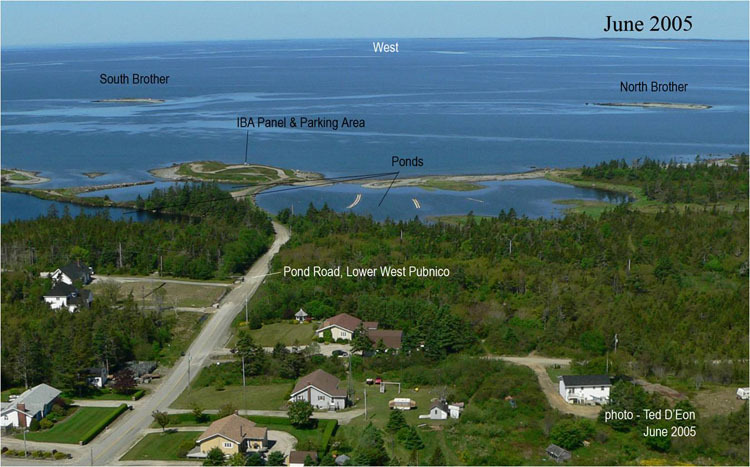 A fine view of ROST feeding from the end of the wharf at Dennis Point, Lower West Pubnico. As many as three ROST feeding with about 20 COTE. Great and very convenient to watch. I believe they were feeding on Herring. July 30, 2014 - North Brother. A quick visit with my brother, Roland. Only a couple of dozen terns there now. 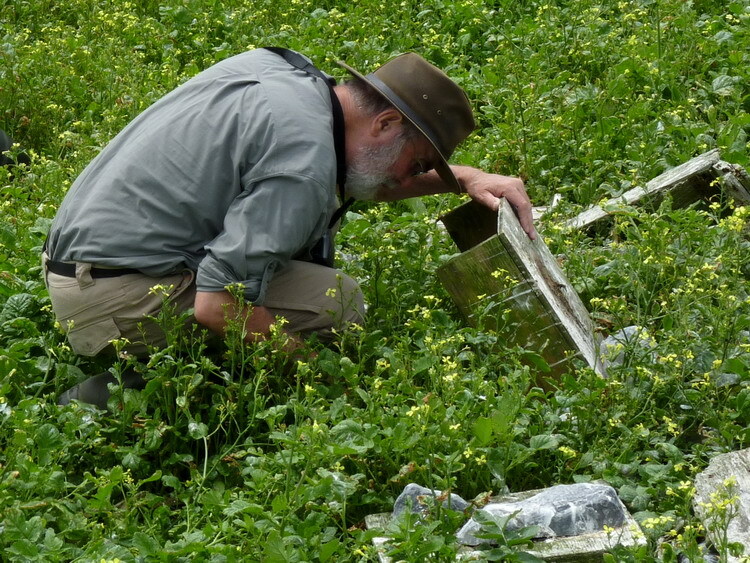 Only a few ROST nesting shelters visible in the Wild Radish, even while walking right over them. The Wild Radish covered almost everything. We only saw one juvenile ROST and only a few adult ROST. The juvenile was unbanded. I expect there were a few more there which we did not see. July 31, 2014 - Pubnico Harbour. 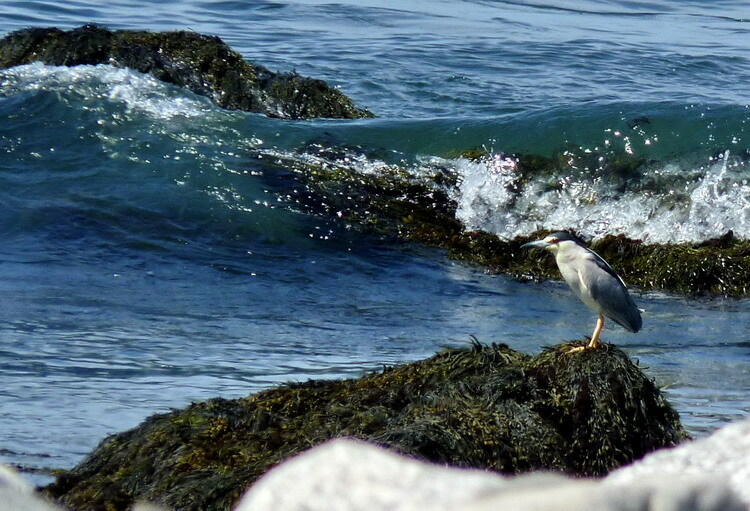 Ronnnie d'Entremont captured this photo (see below) of a banded ROST, below the Inshore Fisheries fish plant in Lower West Pubnico. B30 is a bird we had not seen yet this summer on The Brothers. 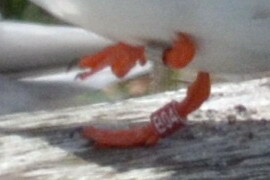 I believe it had been banded as a chick on N. Brother, July 3, 2012. A great shot and a great find, Ronnie. Thanks. August 5, 2014 - Sand Hills Provincial Park, Villagedale, Shelburne County, NS. Ronnnie d'Entremont reported seeing a ROST there today within a group of COTE. 802-04928, PFR B65 added on June 12, 2014. 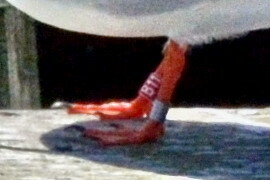 1172-79312 - Banded on June 21, 2012 as an adult on N. Brother. 1172-79348 - Banded as an adult on N. Brother, June 20, 2013. 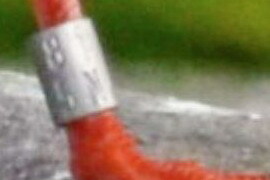 1172-79116 - Banded on July 4, 2011 as a chick on Country Island. 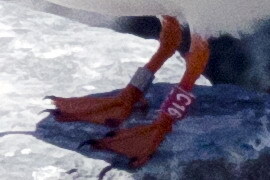 1172-79138 - Banded on July 13, 2011 as a chick on Country Island. 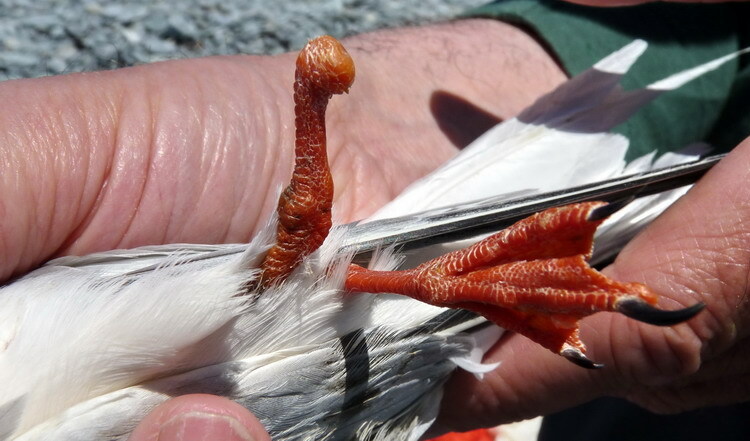 802-04972, Banded on North Brother, Nova Scotia, July 14, 2009. 9822-51515, Banded as an adult on N. Brother June 23,2014. 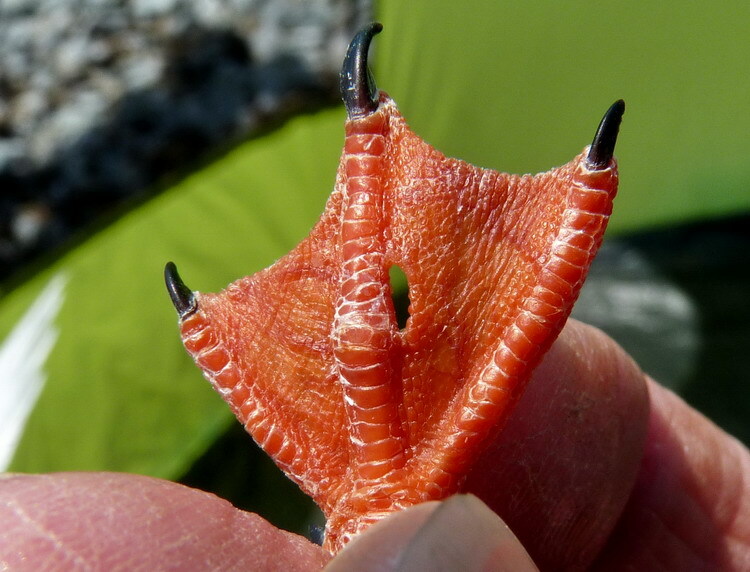 This was the bird which had lost most of its toes. 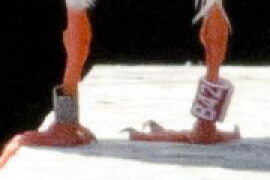 in 2007 with band properly placed on its right leg above the foot. 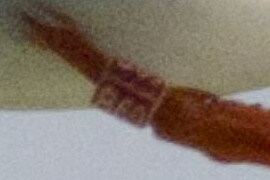 Could not tell condition of right foot on the 2014 photo. 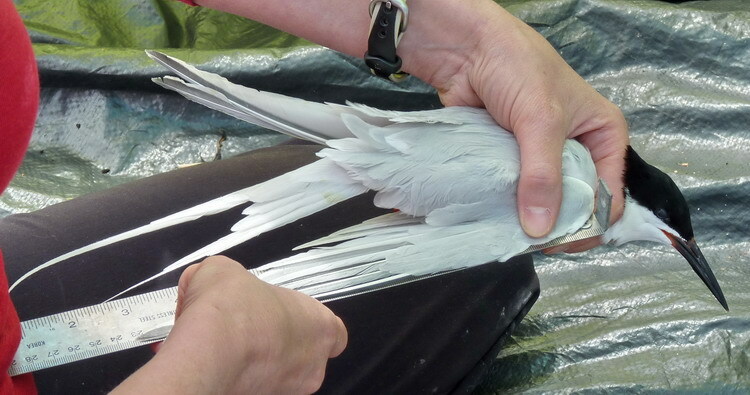 Banded as an adult on N. Brother, June 20, 2013. Seen and photographed in Pubnico Harbour on July 31, 2014.